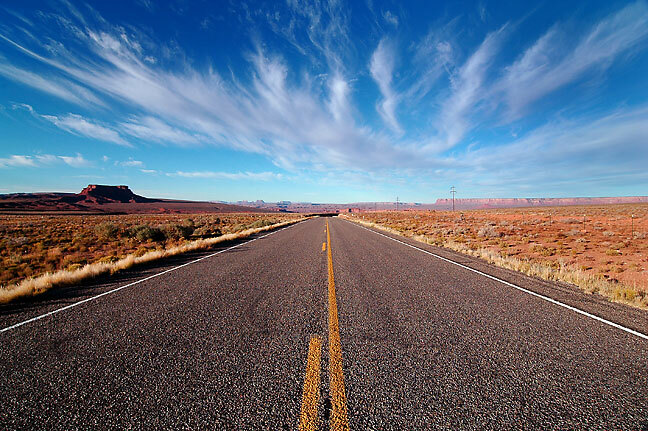 Cinema fans might remember this spot on U.S. 191 is where Forrest Gump decided to stop running. This image ended up being one of my strongest from this vacation. 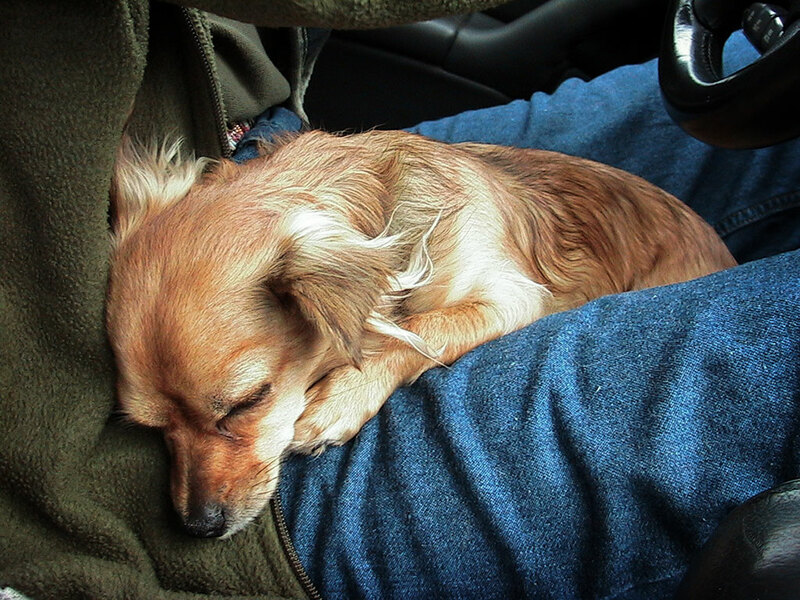 Sierra sleeps soundly in Abby’s lap as Abby takes her turn behind the wheel on our 16-hour drive to Monticello, Utah. 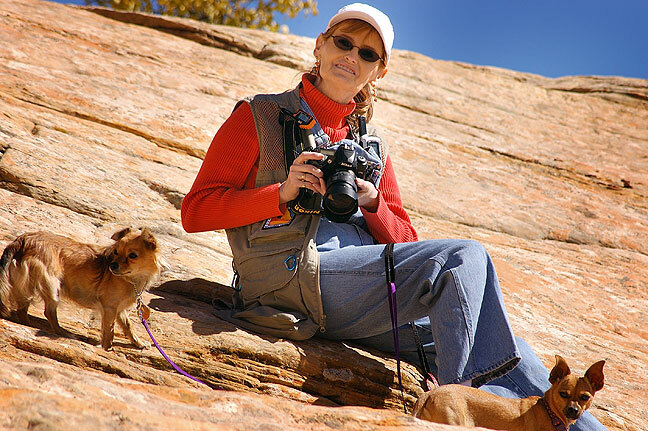 For our second anniversary, Abby and I gathered our dogs, Chihuahuas Sierra and Max, for a trip to Utah. Our driving day, straight through to Monticello, Utah, was about 16 hours, but we had fun, and the dogs did just fine in our laps. By the time we arrived, it was cold in Monticello. We stayed in the Navajo Trail motel, which we liked very much. 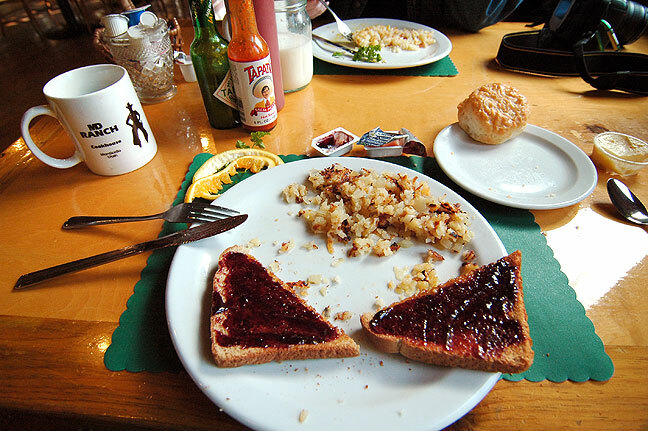 Monticello, Utah, has few restaurants, so MD Ranch Cookhouse became our favorite for dinner, lunch, and, as in this image, breakfast. We were fortunate to find a place we liked so much in such a small town. 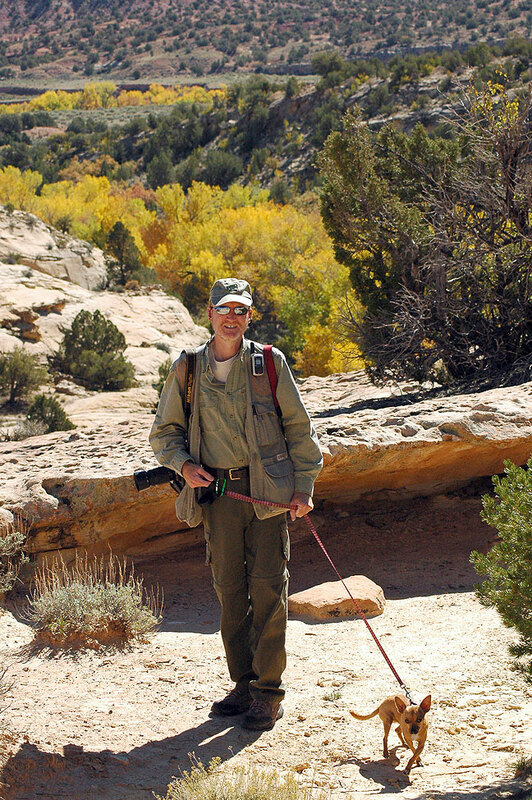 Abby photographed me on the short trail to the ruins at Butler Wash.
We hiked with the dogs to Butler Wash ruins and natural bridge (sometimes referred to as a natural arch), where they minded well and seemed to have a great time. Abby and Sierra pose for me at Butler Wash. 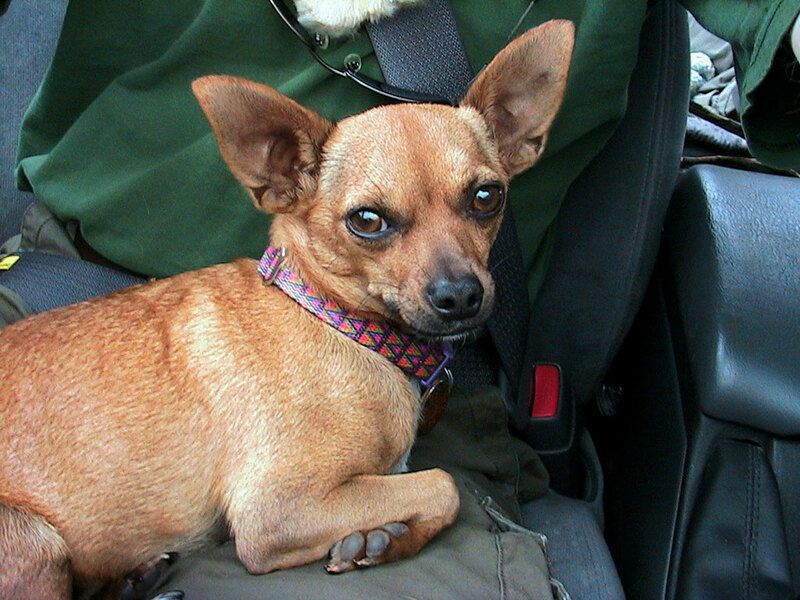 Your host holds Max the Chihuahua on the Butler Wash trail. 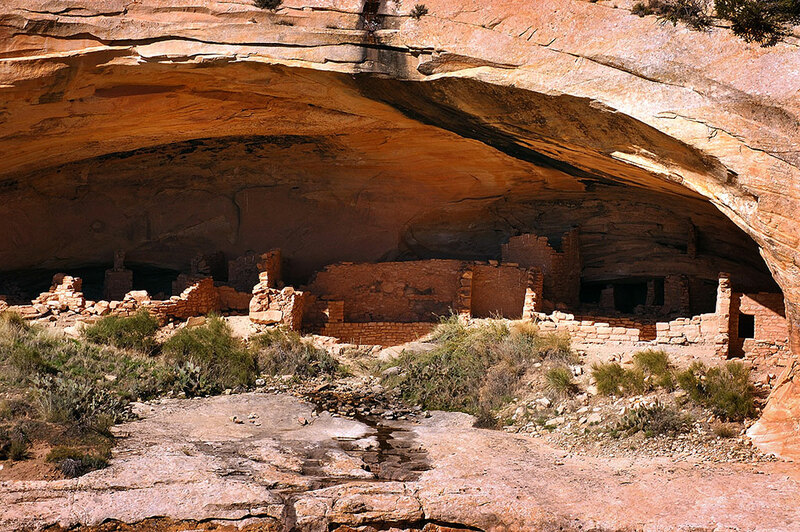 The native ruins under an alcove are the primary attraction at Butler Wash, but we were more interested in the sunshine, cool temperatures, beautiful land. Abby made this broader view of the alcove that houses the ruins at Butler Wash.
Abby smiles as she makes pictures with our Chihuahuas, Sierra and Max, at Butler Wash. 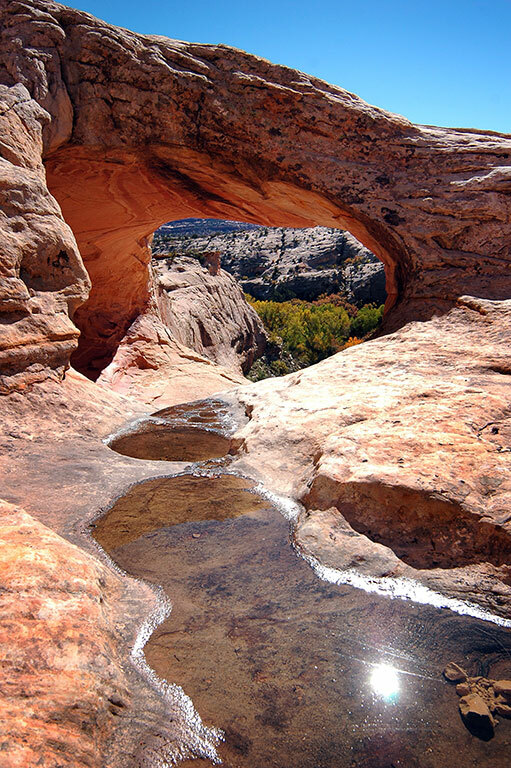 This handsome natural bridge at Butler Wash is easy to access. 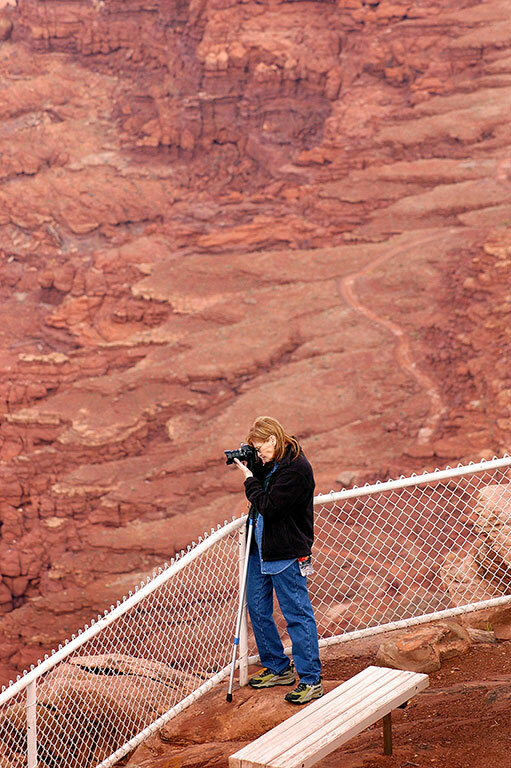 There was some water in the wash.
Abby photographed me making pictures at Butler Wash.
Water flows from pothole to pothole above the natural bridge at Butler Wash.
Abby props her camera on a fence as she makes pictures at Bulter Wash. 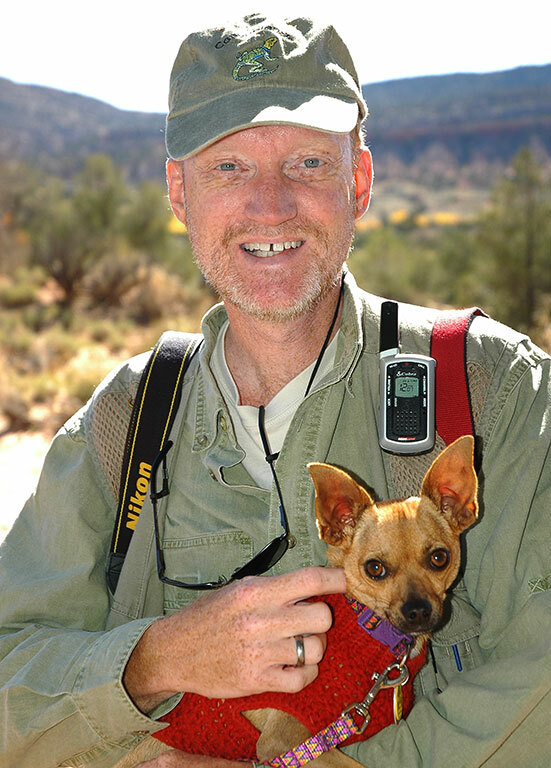 The author hikes with Max the Chihuahua on the Butler Wash trail. Abby made this image as I photograph the Butler Wash ruins from the south end of the attraction. 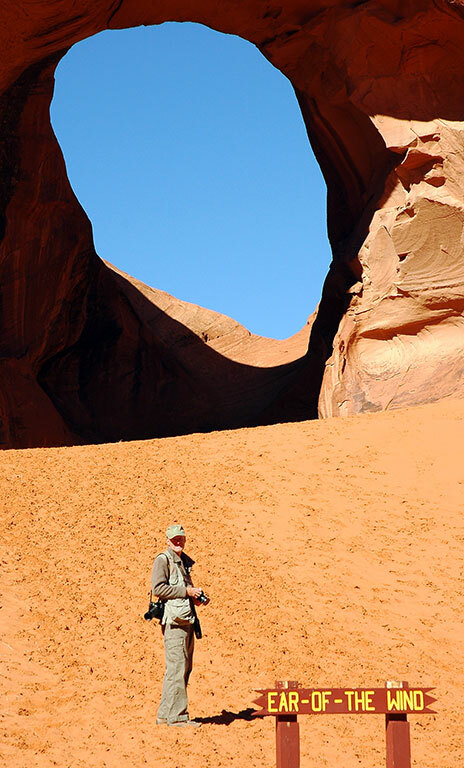 I like this image of me making pictures near the natural arch at Butler Wash because it creates a sense of scale. We drove to Muley Point overlooking the San Juan River, where we left the dogs in the car and scouted around for a few minutes. 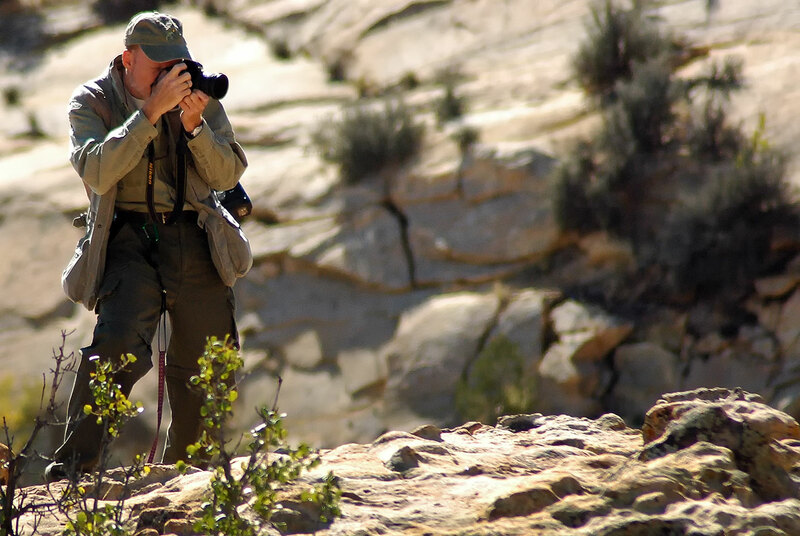 Abby photographs Muley Point, Utah. 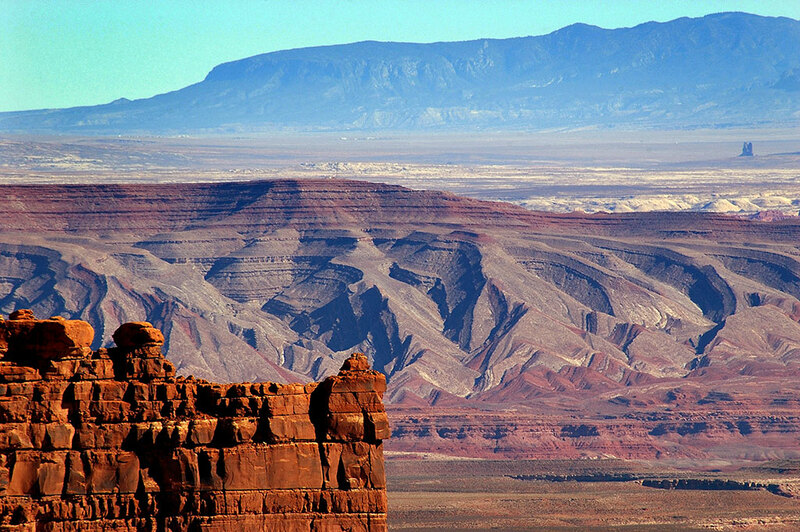 Some of the features of Monument Valley are visible in this telephoto image looking south from Muley Point, Utah. 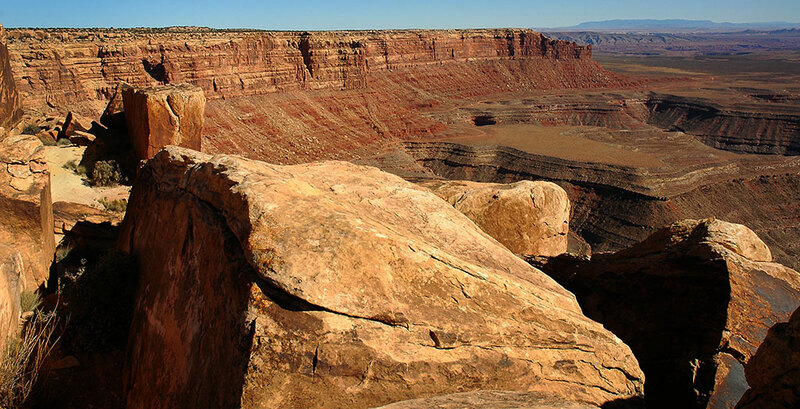 Abby strolls around the Muley Point overlook. 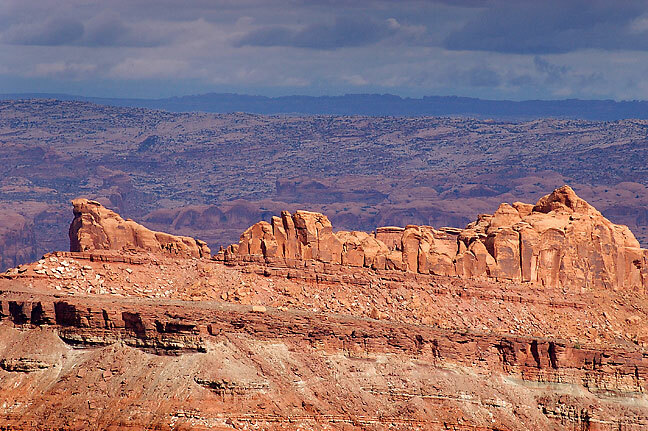 Abby shot this Muley Point panorama looking east. 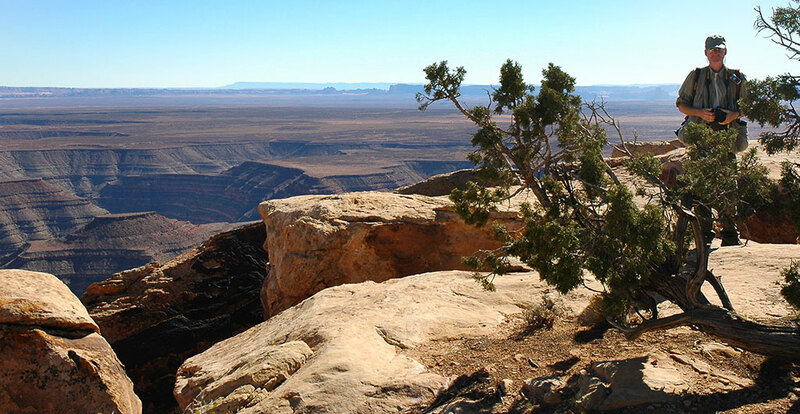 I am visible in this frame by Abby from Muley Point. 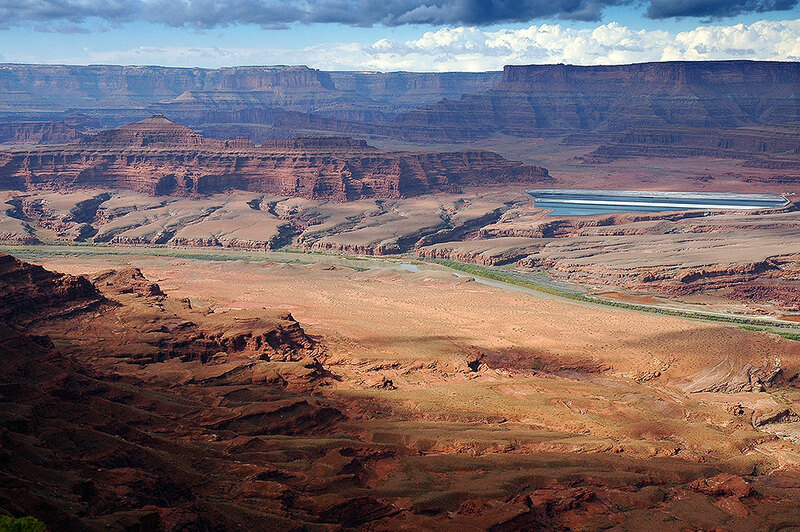 This wider angle view from Muley Point emphasizes the meanders of the San Juan River below. 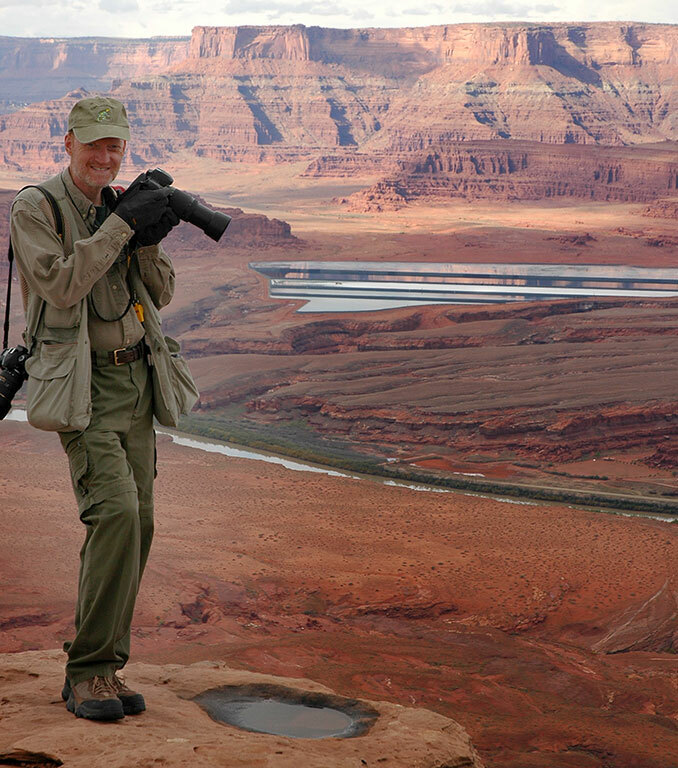 I smile for Abby’s camera as we photograph Muley Point. The meanders of the San Juan River are behind me. 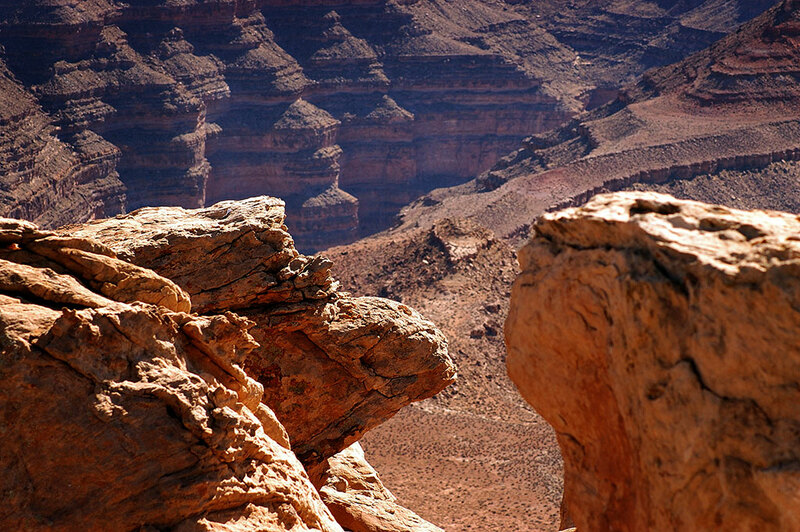 Muley Point stands 1200 feet above the San Juan River. 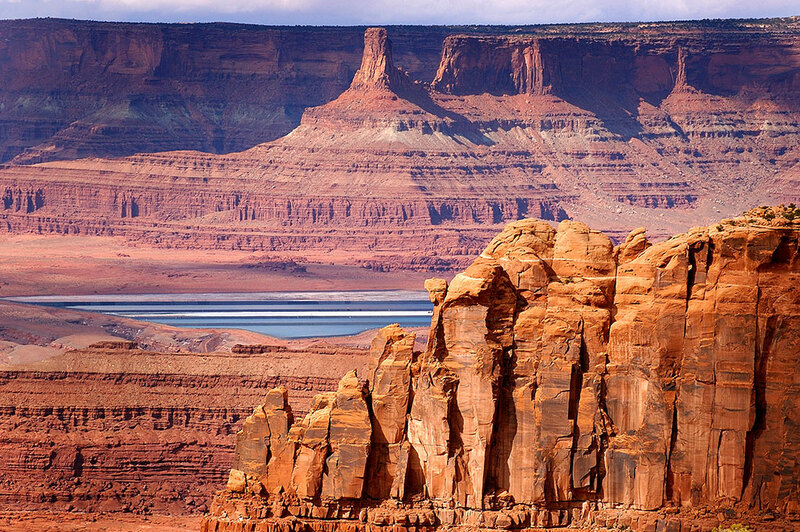 The layers carved by the river reveal 260 million years of geologic history. 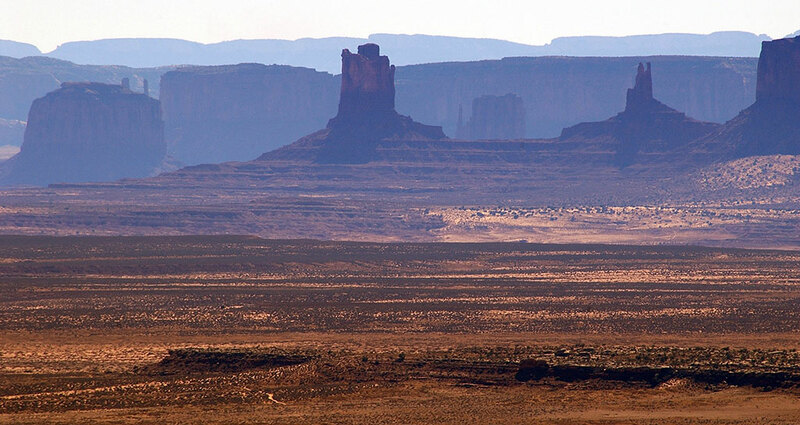 This longer telephoto view from Muley Point shows more of the features of Monument Valley, which we visited the next day. 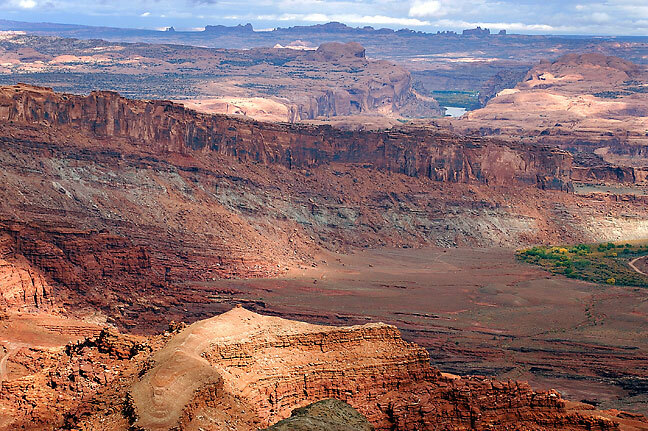 Although there is nowhere to hike at Muley Point, when visibility is good, the depth of the images can be amazing, as in this one that looks beyond the San Juan River into Colorado. 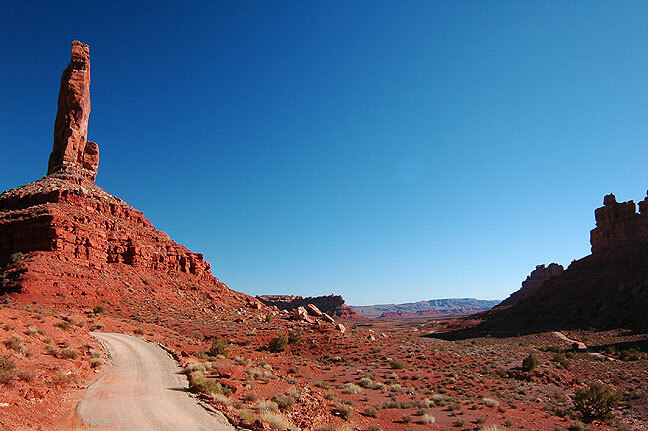 We stopped briefly at the Mokee Dugway, the steep gravel highway leading up Cedar Mesa from far southern Utah, that we visited in 2003 on The High Road. We were amazed at the number of stickers that had accumulated on the sign in the three and a half years since our last visit. 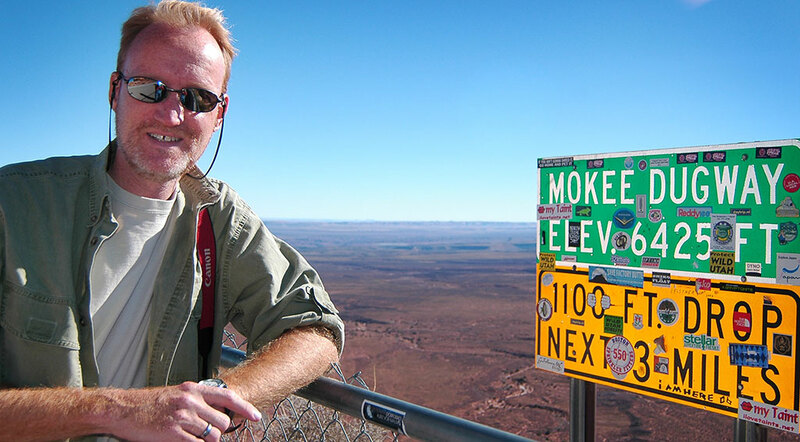 Your host poses at the sign at the top of the Mokee Dugway. Just three years earlier, this sign had no stickers on it. 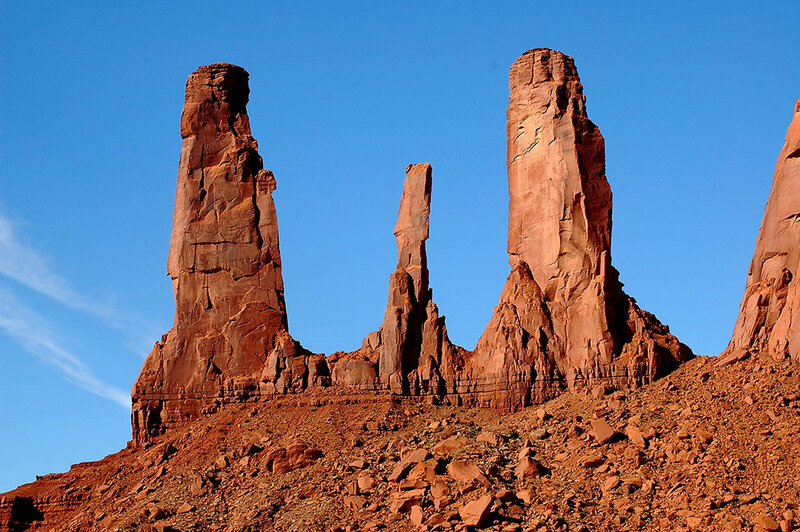 Abby made this image of Valley of the Gods. 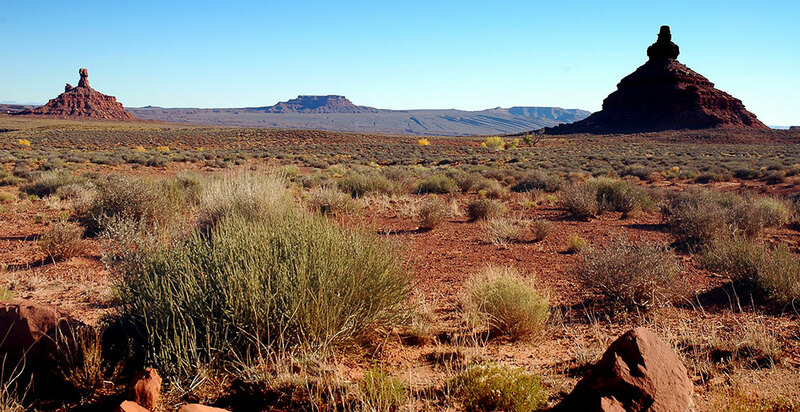 Once down the Dugway, we took the Valley of the Gods road, which leads across an expanse of desert punctuated with pinnacles, washes, boulder fields, and one small campground. The sky was beautiful. 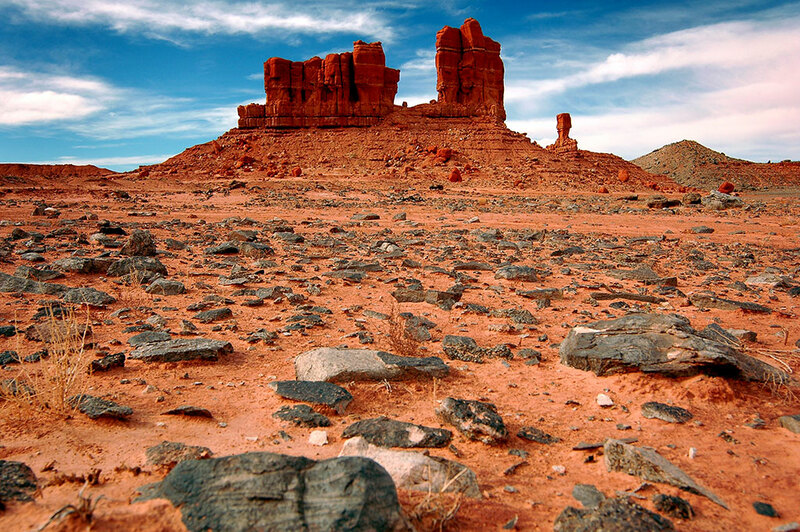 Valley of the Gods is beautiful and sparsely visited. 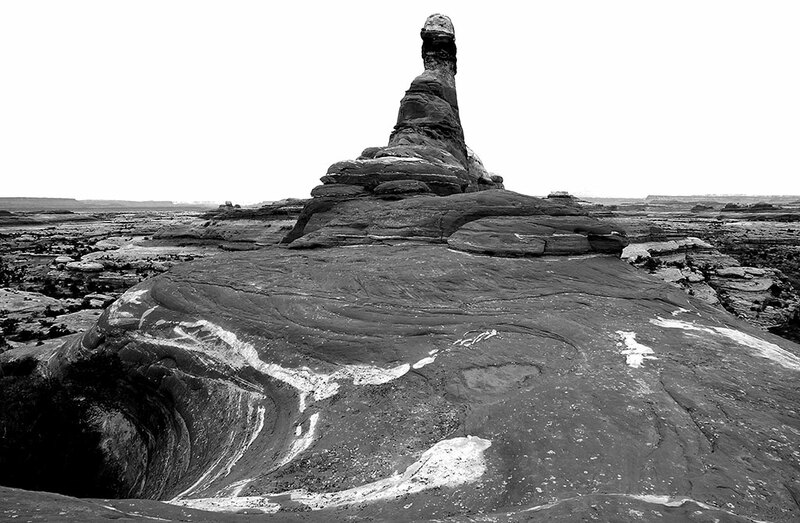 This hoodoo standing atop a talus slope is one of the most prominent features of Valley of the Gods. 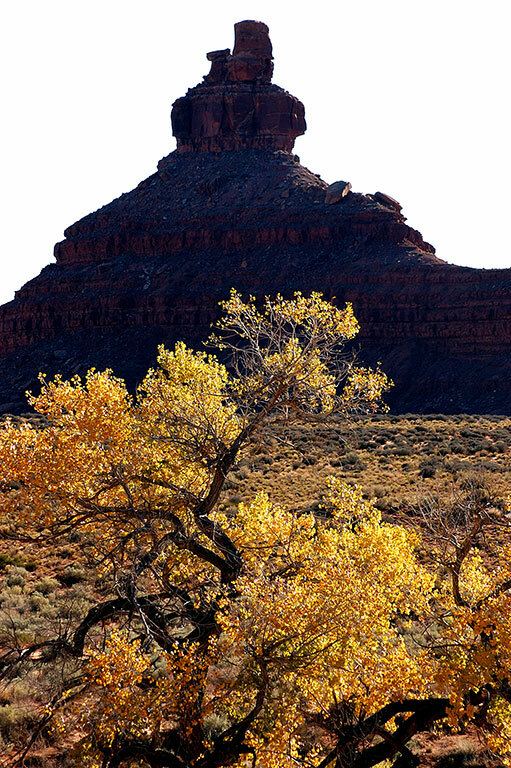 Golden foliage is set against a spire at Valley of the Gods. 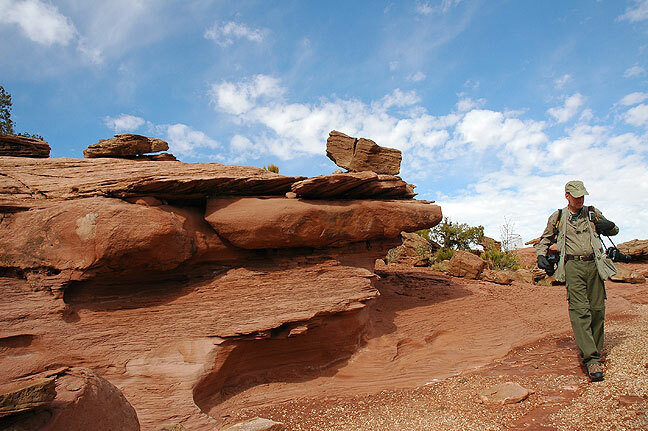 A large cairn sits by the road at Valley of the Gods. I don’t know if it marked anything. Abby has breakfast at MD Ranch Cookhouse. We had a wonderful dinner together in Monticello at MD Ranch Cookhouse. We left to dogs nested in our room in Monticello. 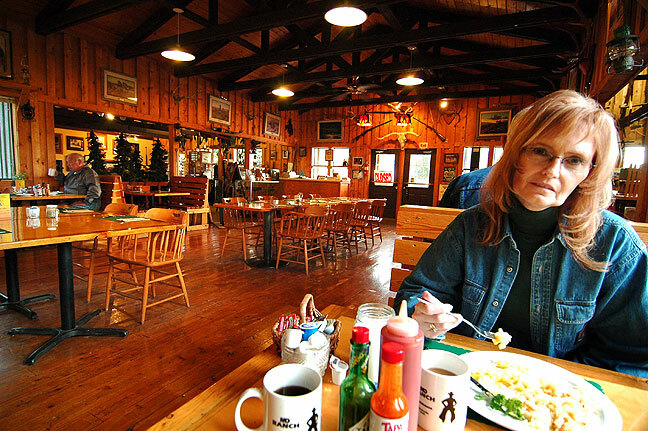 We had breakfast the MD Ranch Cookhouse. 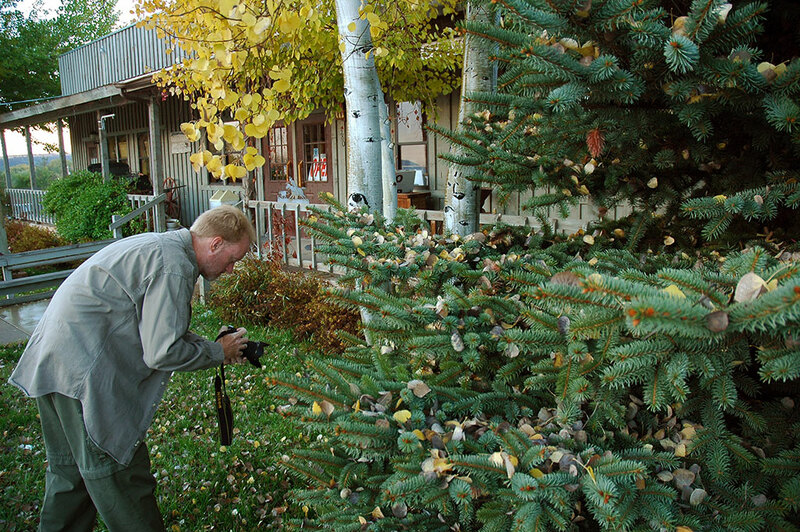 Your host photographs frost melting from trees outside MD Ranch Cookhouse in Monticello, Utah. 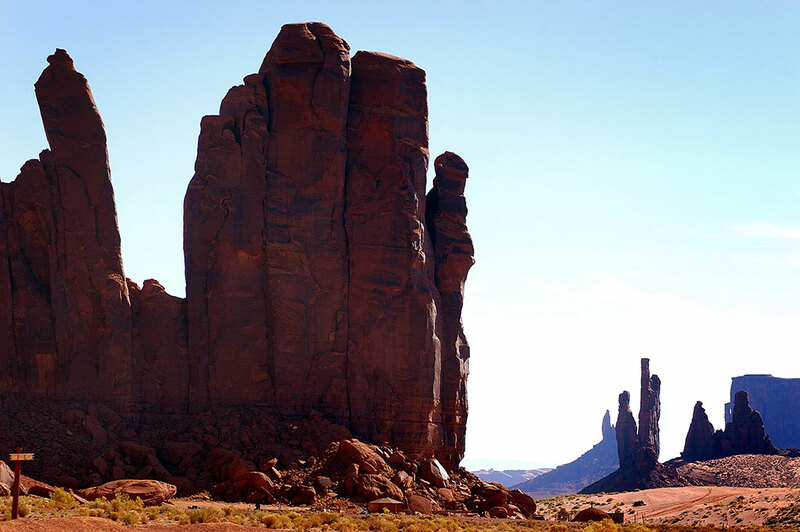 We took the guided tour of the Monument Valley Tribal Park. 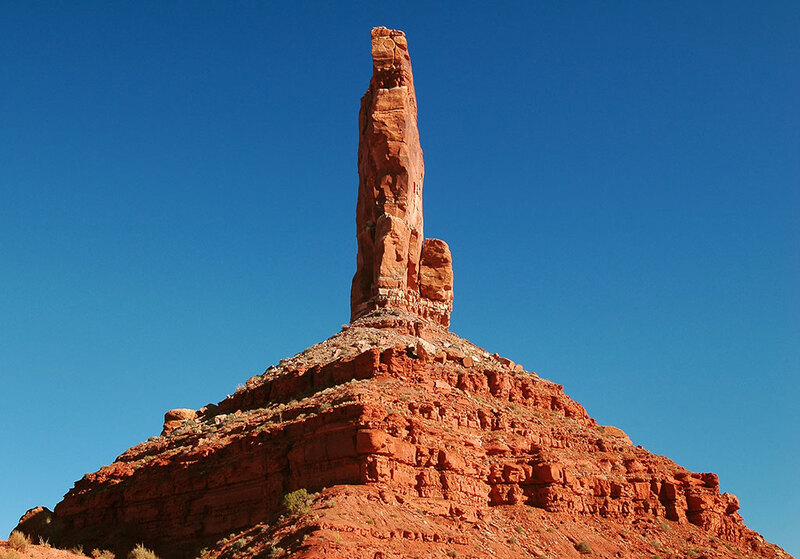 The entrance is just north of the Utah-Arizona state line, but the tour resides inside Arizona. The tour was $50 for each of us, and Abby and I strongly recommend it. 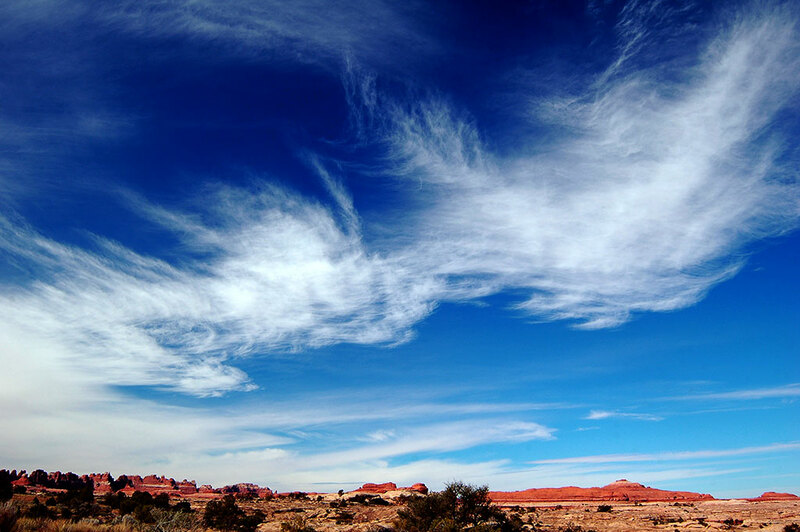 Cirrus clouds are visible in a cold morning sky on U. S. 191 near the Arizona-Utah border. 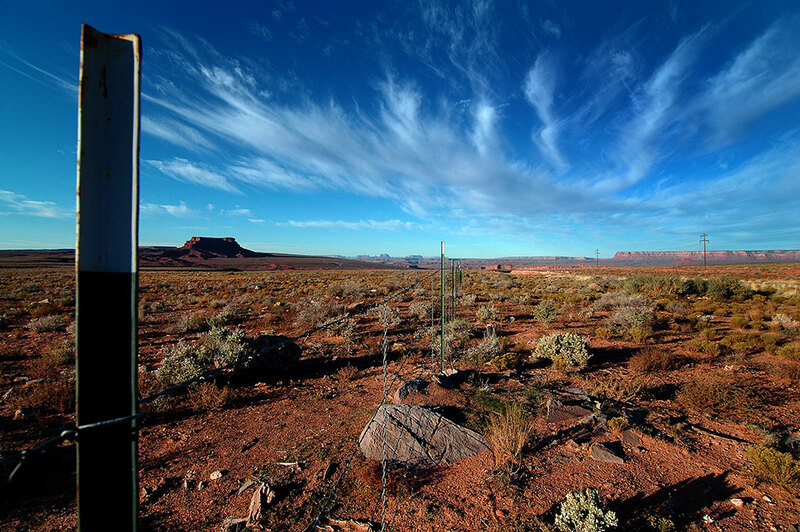 The morning was very cold as we approached Monument Valley from the north, and the sky was beautiful. 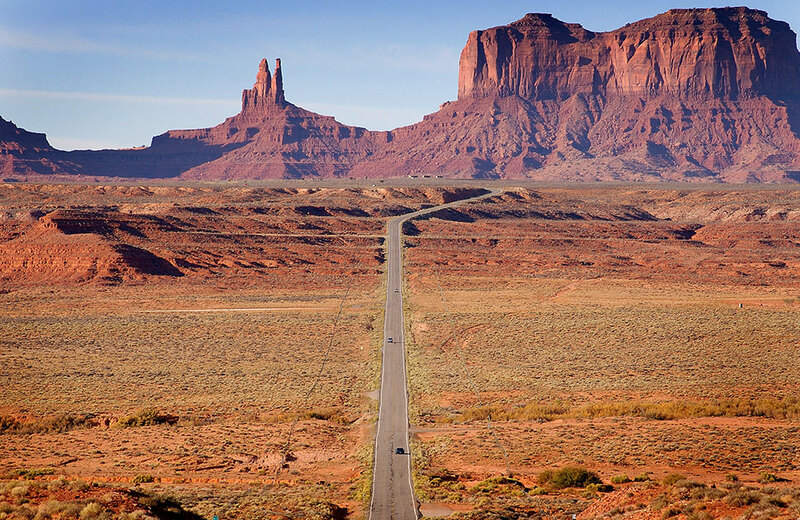 U.S. 191 stretches into Arizona in this view looking south as we approach Monument Valley Tribal Park. 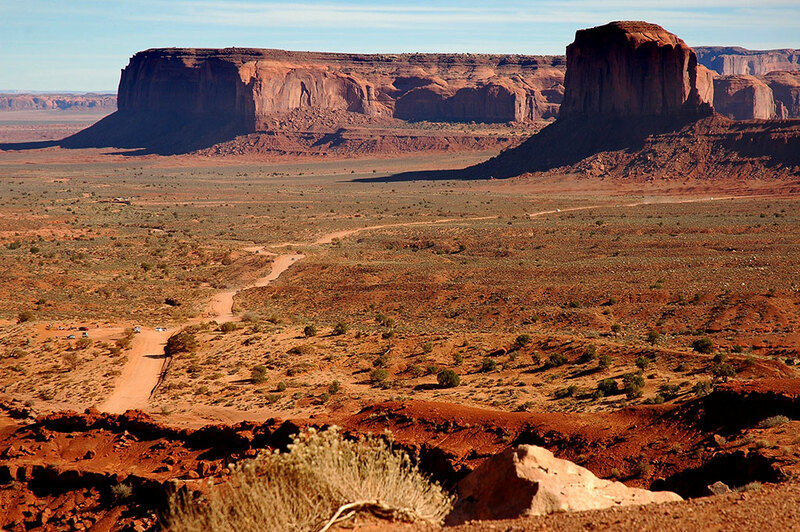 Abby’s image shot from the Mittens Overlook shows the road into the Monument Valley Tribal Park. 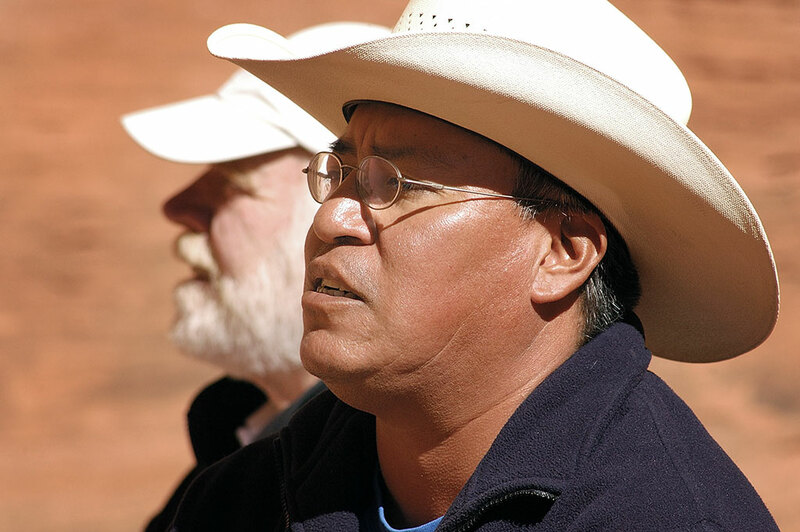 This was our guide at Monument Valley, singing a chant for us at one of the natural arches we visited. 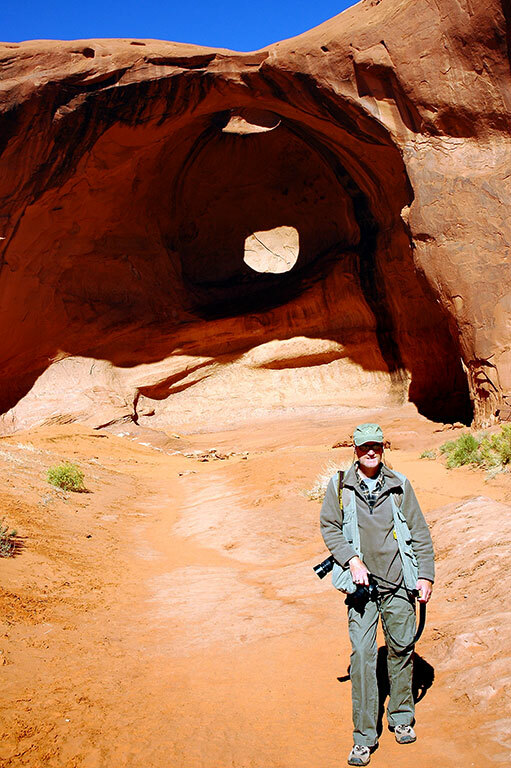 Our guide, one of dozens of loosely-organized Navajo Tribe members, took us and a German couple through the park to four impressive natural arches. In the process, he told us stories of the land and its features, and at one point even sang a chant for us. 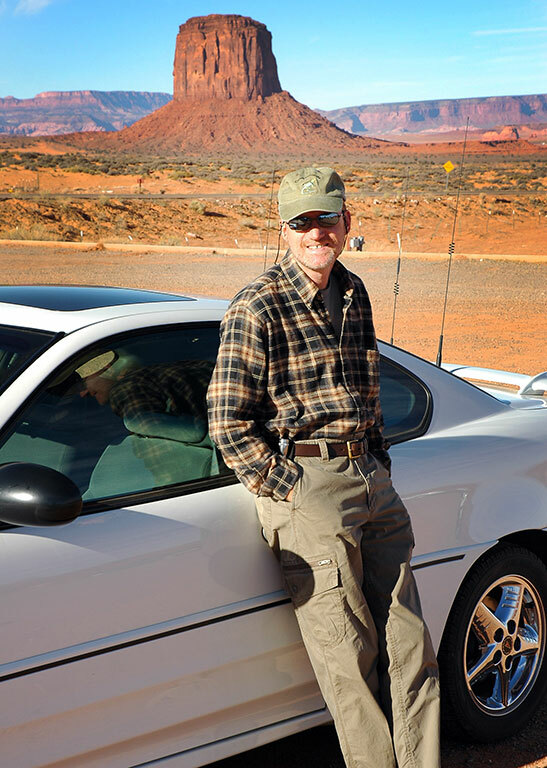 His vehicle was an ancient Ford pickup with benches mounted on the bed for us to ride, covered with a rickety awning, all held together by duct tape. Abby liked our tour guide so much, especially his singing, that she tipped him $20. 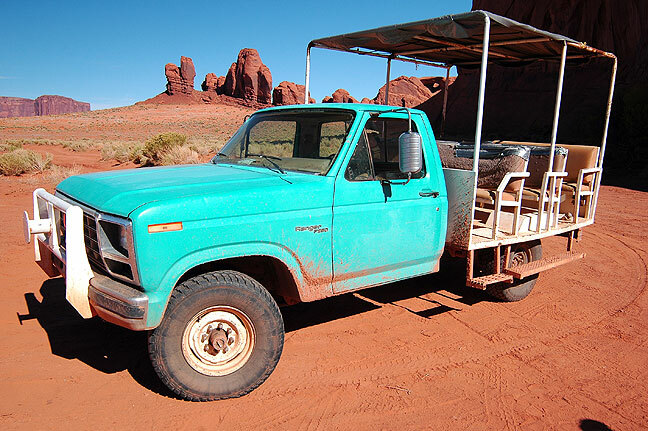 This was the luxury accommodation in Monument Valley, a 1970s era Ford F-150. 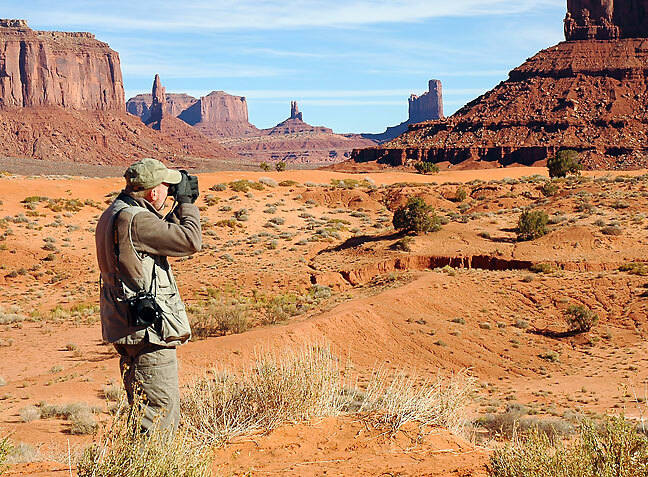 Photographing Monument Valley; it was cold enough that I needed gloves and a fleece pullover, and Abby wore her warmest coat. 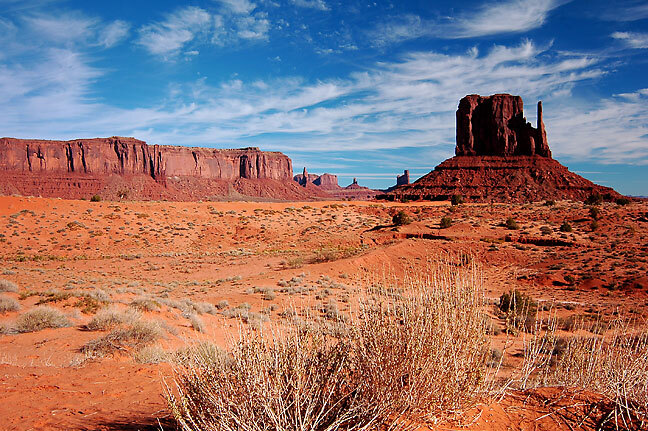 The cold, clear air meant a gorgeous sky above the mesas and butte of Monument Valley. 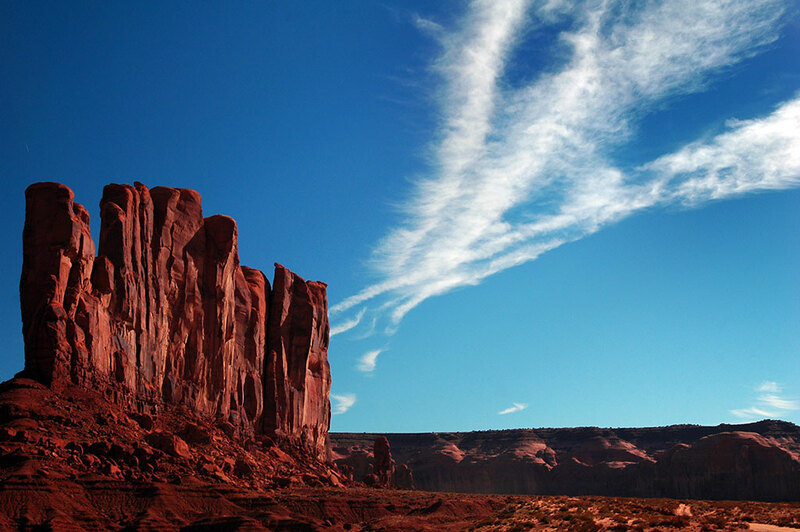 Clouds wisp past us as we photograph Monument Valley. 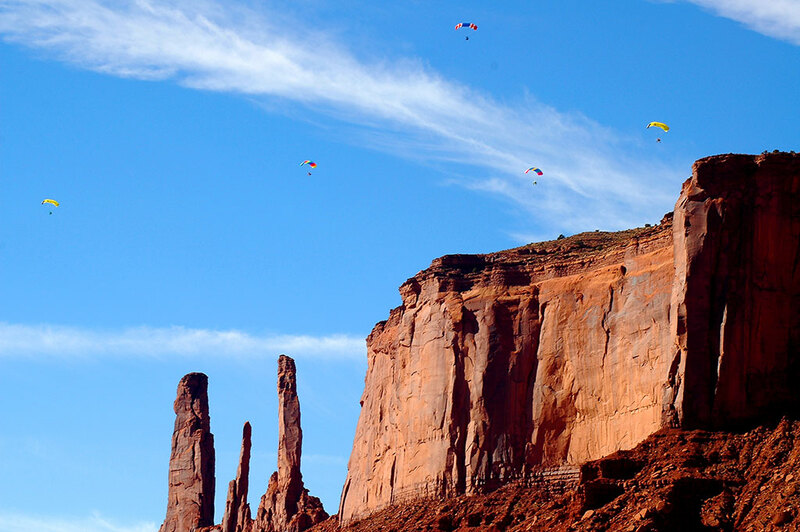 Abby photographed these five powered paragliders above John Ford’s Point at Monument Valley. 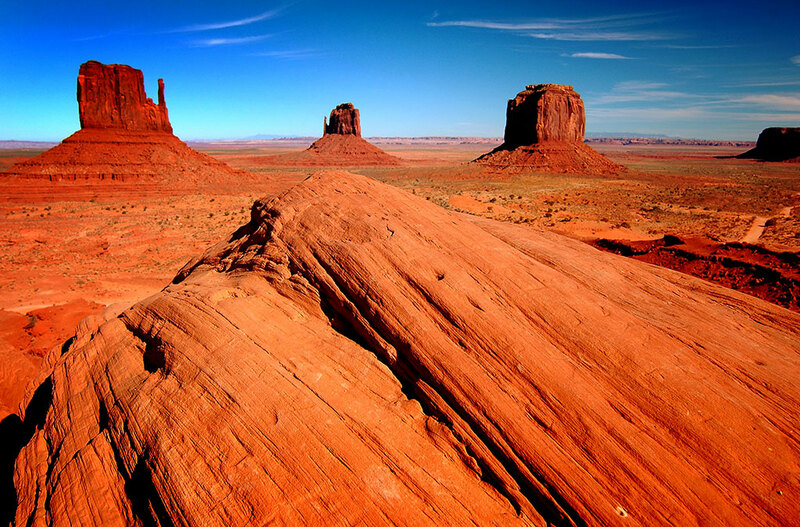 Abby made this image early in our Monument Valley tour. 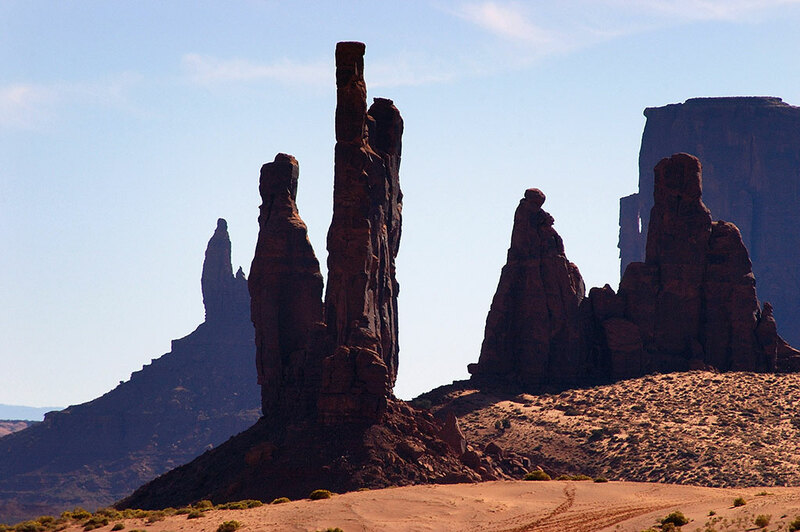 Farther down the road in Monument Valley, we photographed this handsome collection of spires. 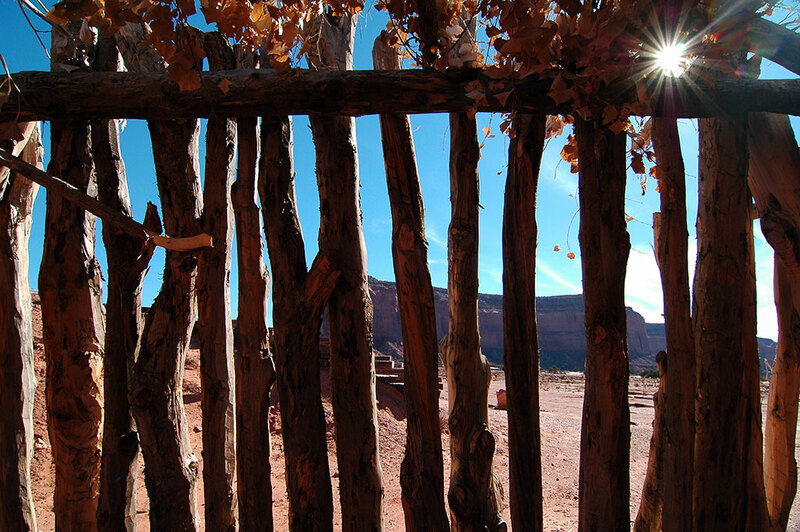 I took advantage of backlighting to made this beautiful image deep in the heart of Monument Valley. 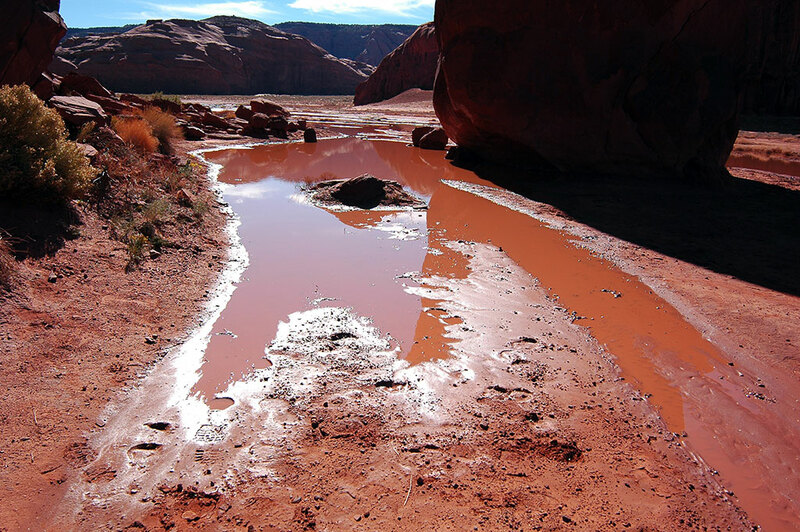 Recent rains in Monument Valley created these ruts in the roads, though our driver had no problems with them at all. 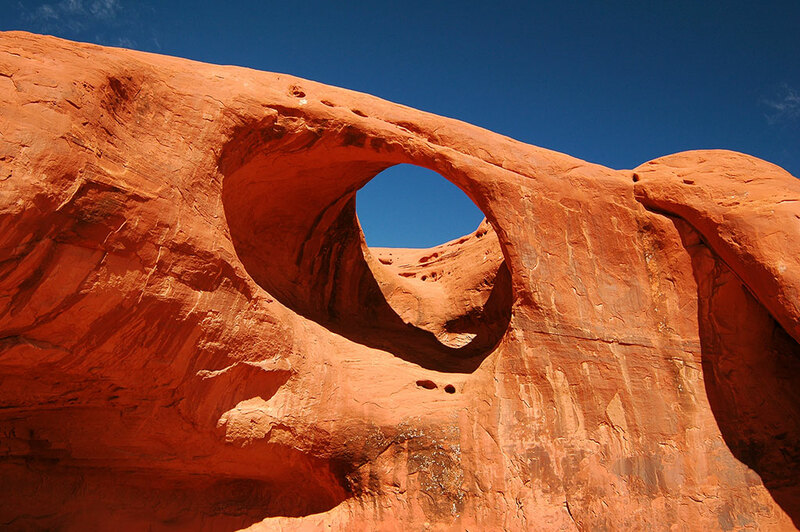 This large natural arch, called Ear of the Wind, is set against perfectly blue skies on a cold morning at Monument Valley, Arizona. 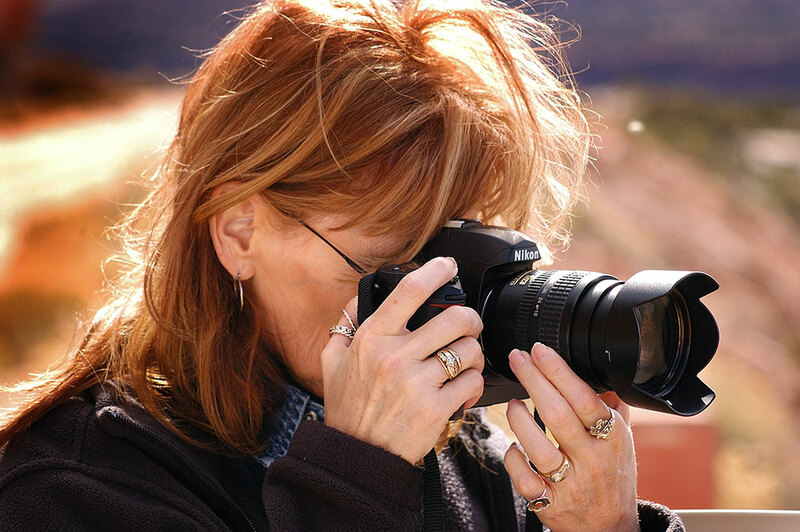 Abby photographed me photographing the Ear of the Wind natural arch. 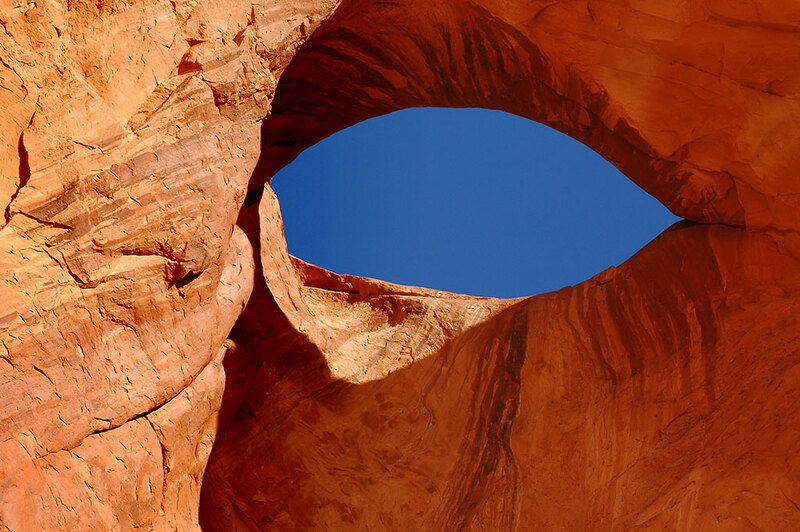 Abby created this elegant rendering of the God’s Eye arch in Monument Valley. 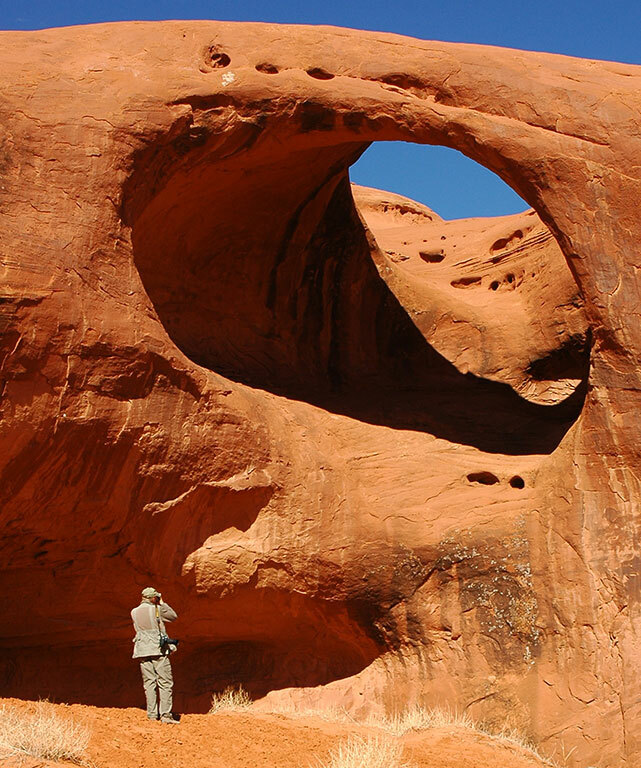 Abby smiles and tries to keep her balance as she photographs the God’s Eye arch at Monument Valley. 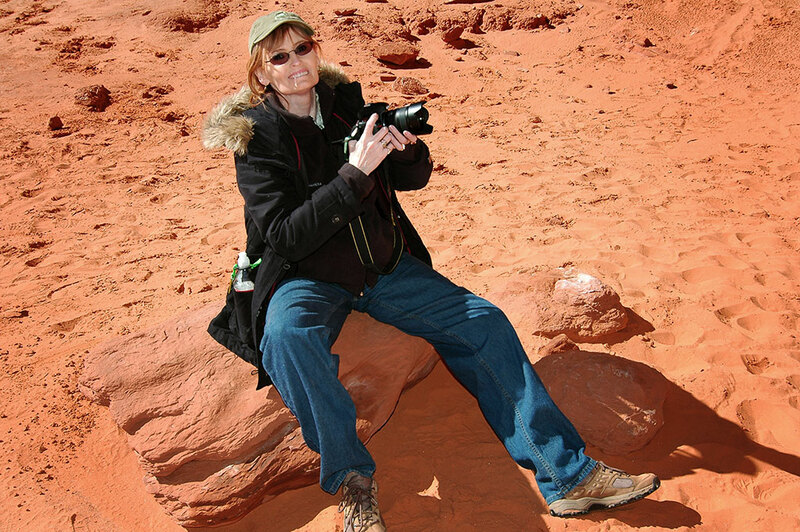 Abby photographed me photographing Mocassin Arch at Monument Valley. 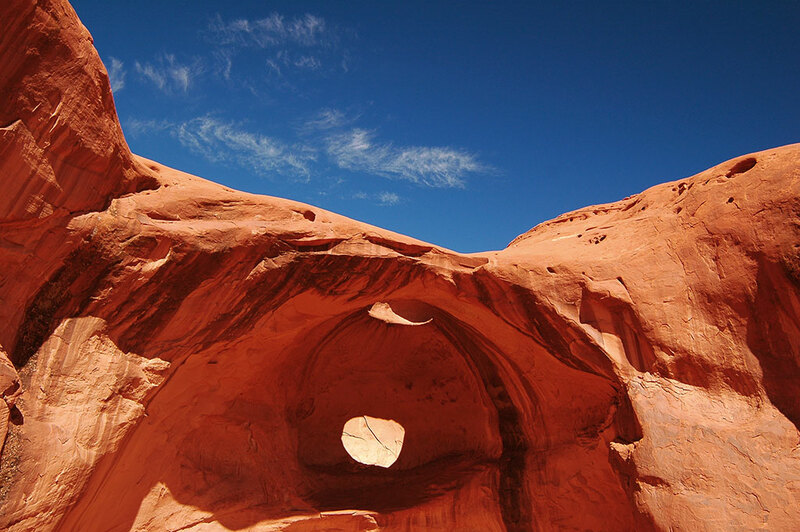 Moccasin Arch stands against a perfect blue sky at Monument Valley. 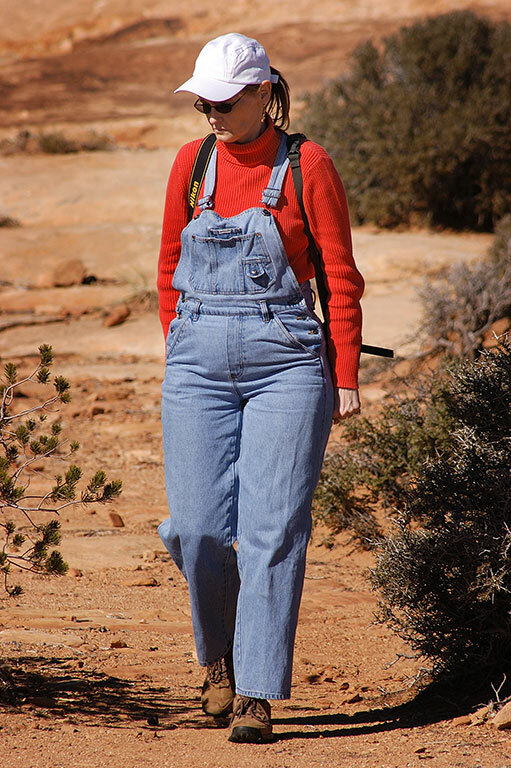 Abby photographed me walking away from Big Hogan Arch in Monument Valley. Although sunny, you can tell it’s still very cold for me to be wearing my fleece pullover. Big Hogan Arch was the last major arch on our trip through Monument Valley. 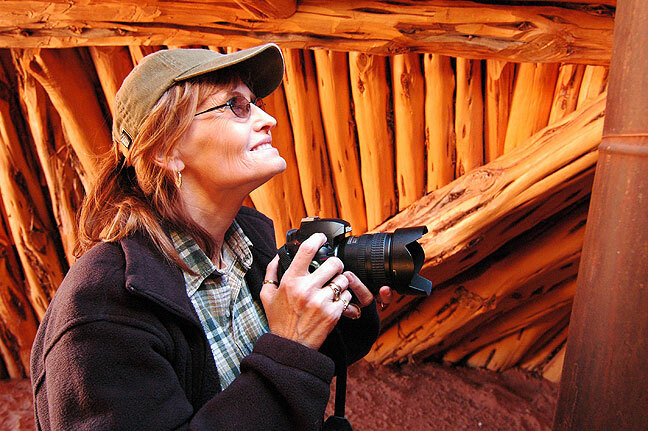 We returned to the visitor center at Monument Valley, where we took time to photograph the hogans on display, which are traditional dwellings. 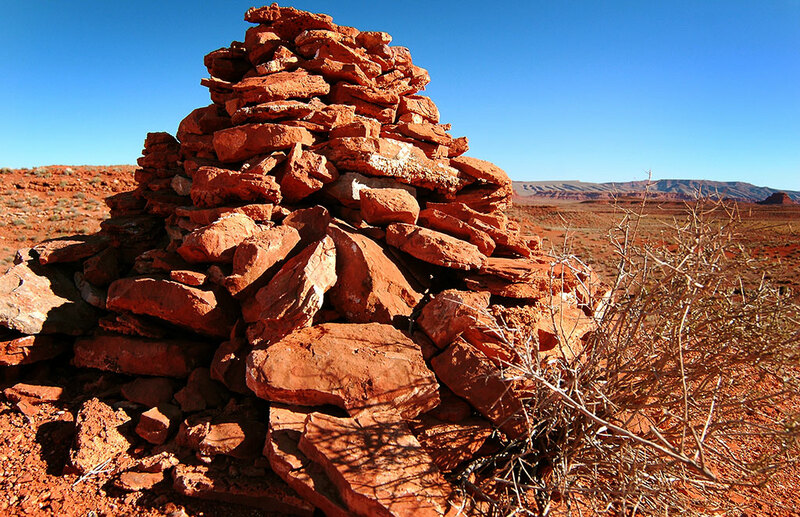 The hogan (hooghan, literally, “place home”) was the basic Navajo dwelling, and in the early 1800s conical, forked-pole hogans (“male hogans”) still dominated, although by the end of the century they would be replaced by the roomier, hexagonal or octagonal, cribwork hogans (“female hogans”). 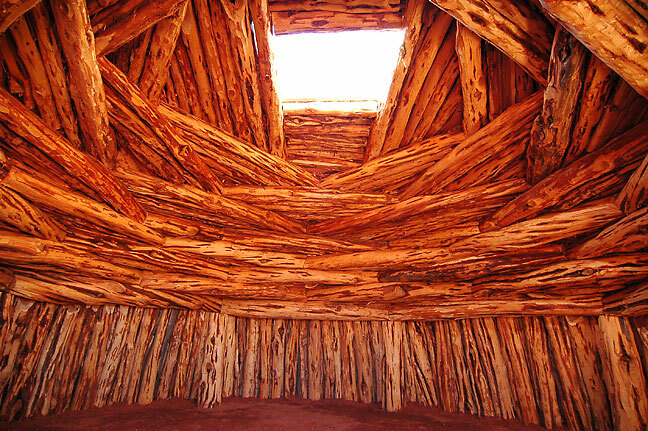 Piñon or ponderosa pine logs serve as the larger timbers for the framework, with juniper often taking a minor role in the construction. 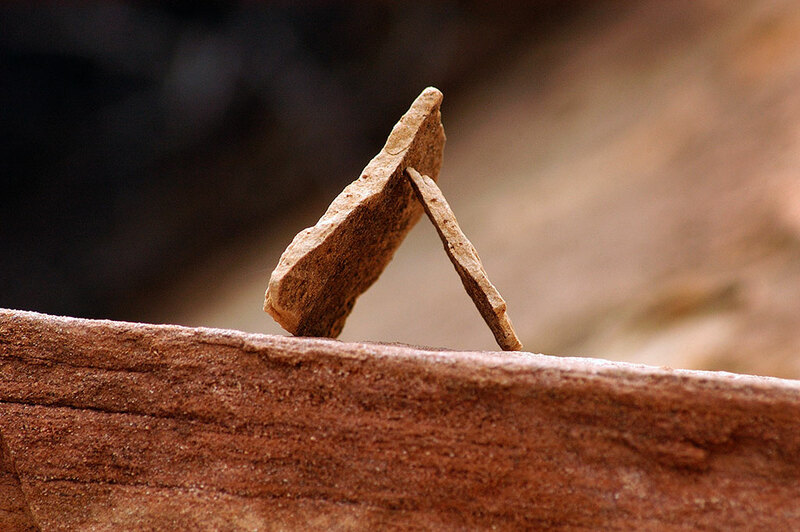 This hogan is on display at the Monument Valley Tribal Park. 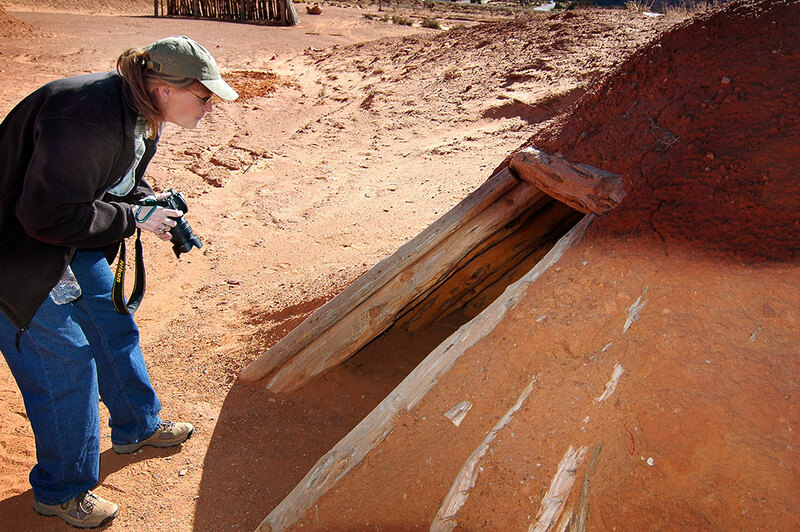 Abby peers into the door of a hogan on display at Monument Valley Tribal Park. 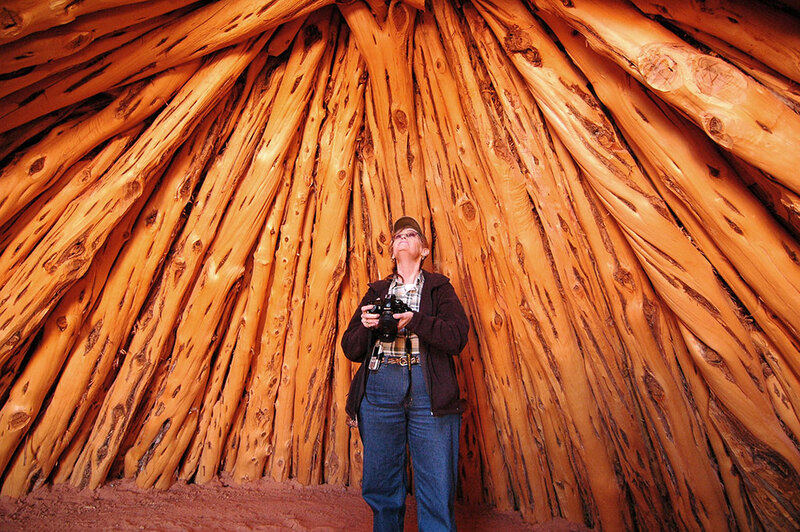 Abby photographs a hogan at the Monument Valley Tribal Park. Abby stands at the back wall of a hogan for scale. 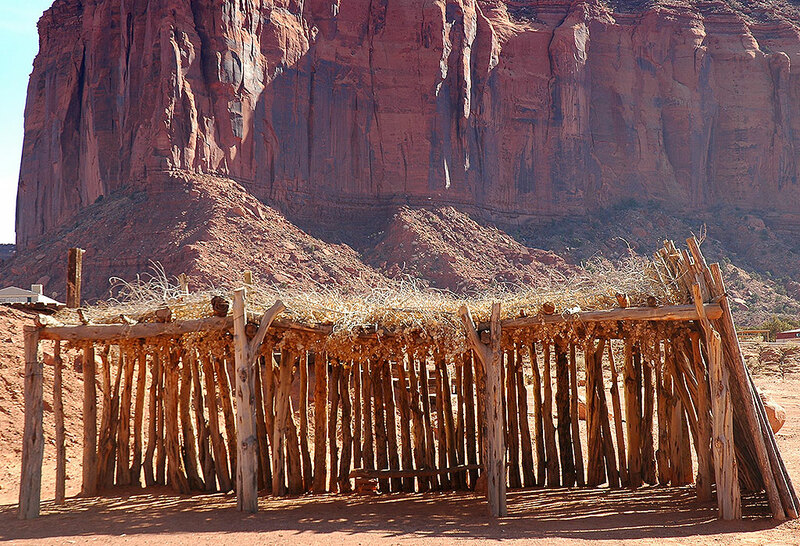 This is one of several types of Hogan, a traditional Navajo dwelling, on display at Monument Valley. 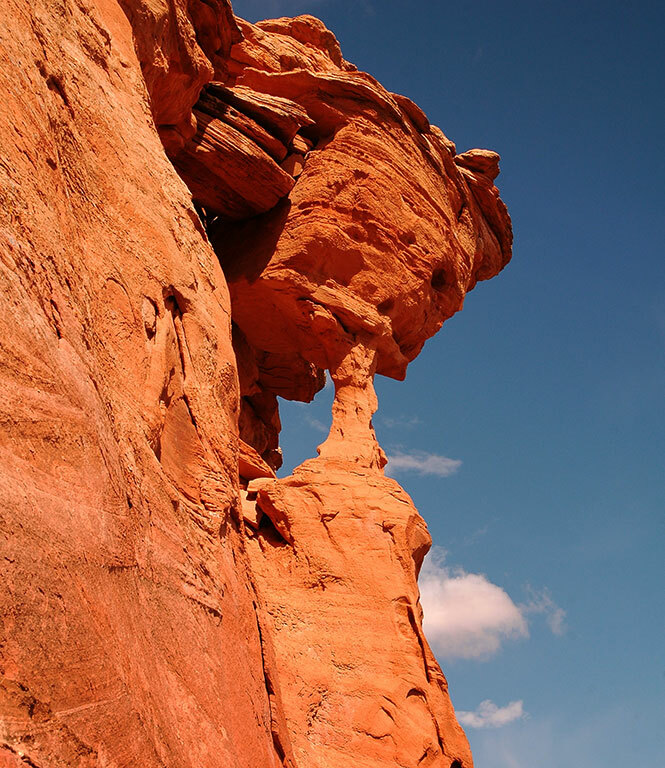 Abby made this excellent image of a hogan set against cliffs in Monument Valley’s chilly, bright October sunshine. 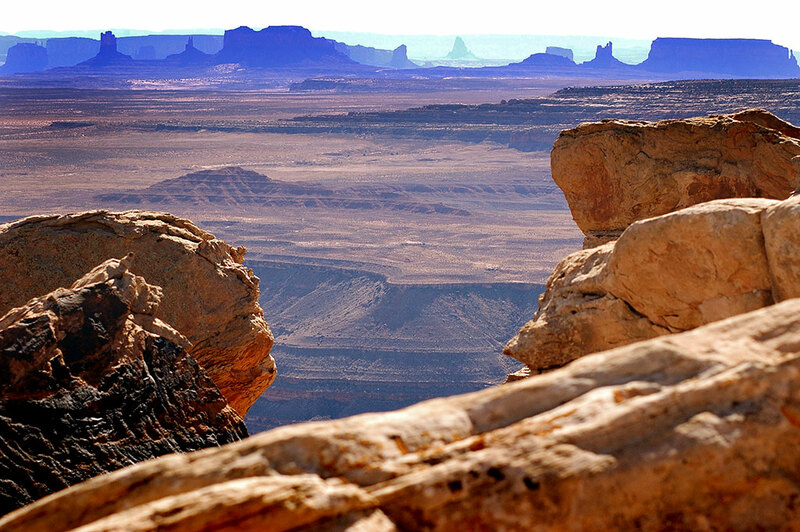 My shadow is divided as I stand at the edge of a Monument Valley cliff. 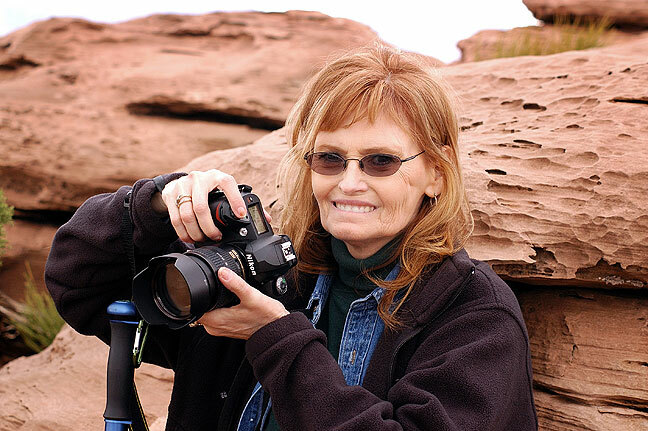 We had lunch at The View Restaurant, then stopped at the quintessential Monument Valley photo op, the Mittens Overlook. 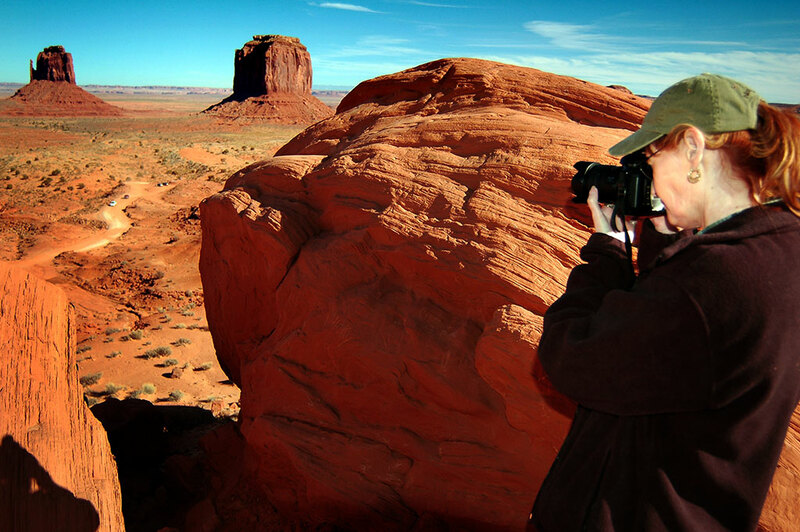 Abby makes pictures at Monument Valley’s Mitten Overlook. This is the image Abby was making in the previous image. 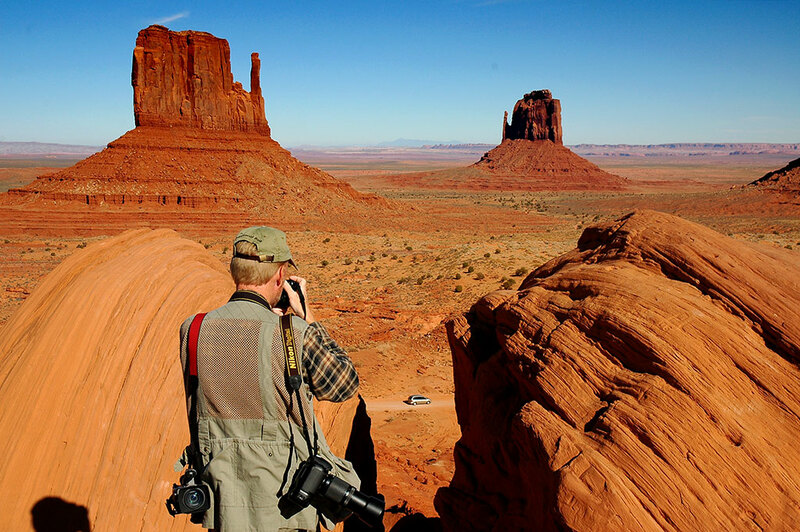 Your host photographs The Mittens, the signature formations at the overlook at Monument Valley. 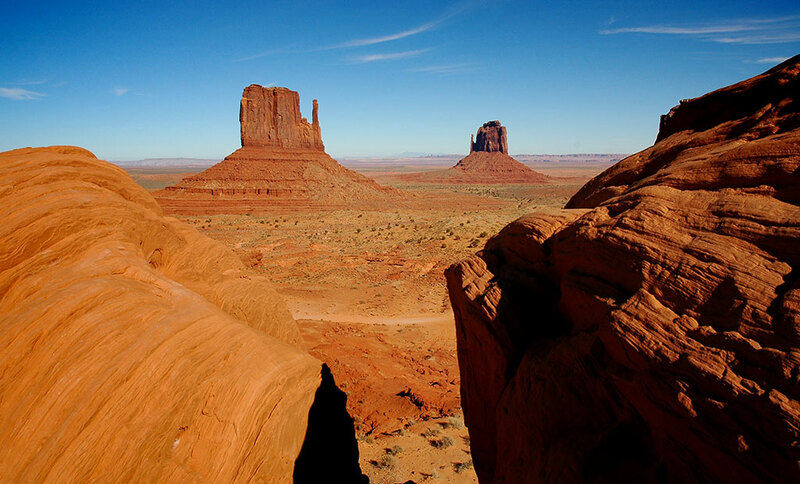 The Mittens Overlook is a classic, if often over-visited, signature attraction at Monument Valley. 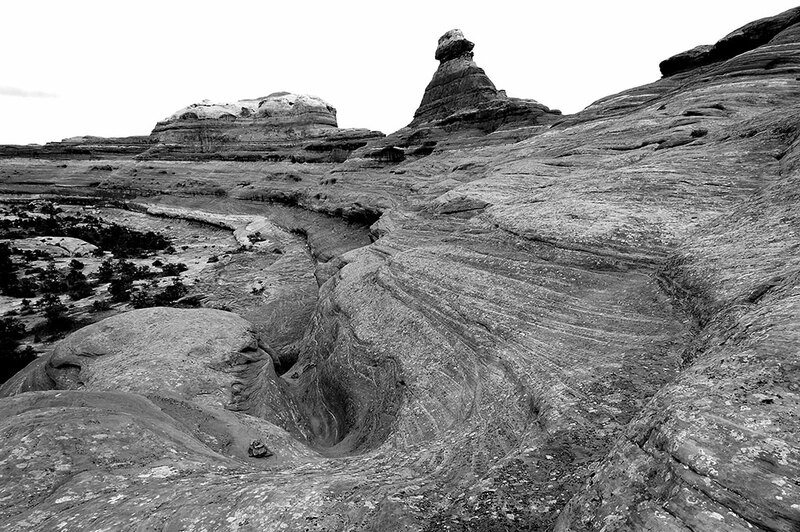 Part of the reason I wanted to photograph it is that Ansel Adams photographed it from this exact spot nearly 60 years earlier. 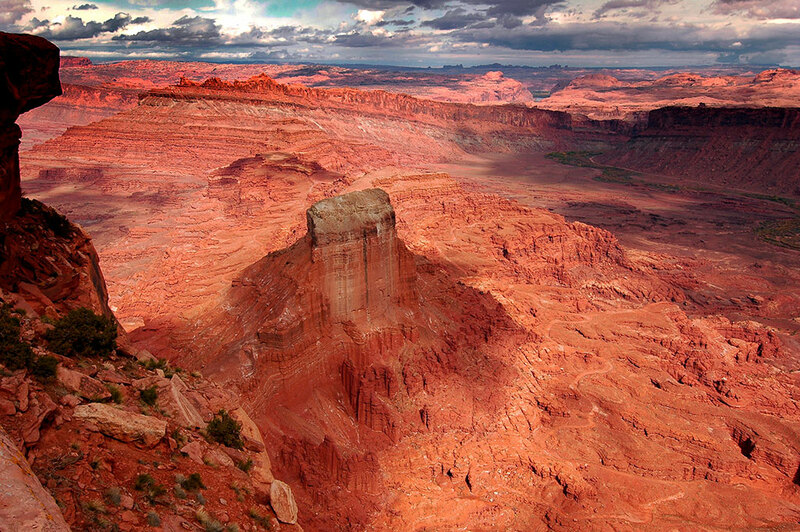 This is another view from the Mittens Overlook. The October light was bold and clear. 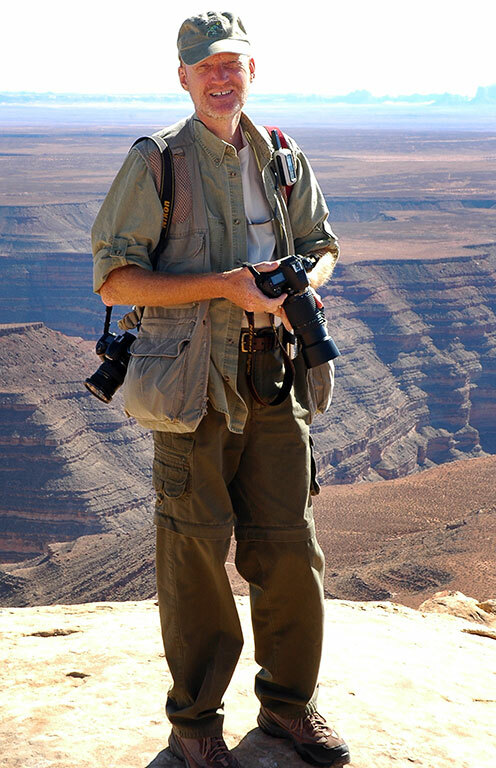 As we were leaving Monument Valley, Abby made this image of me. If I look happy, it’s because I am. 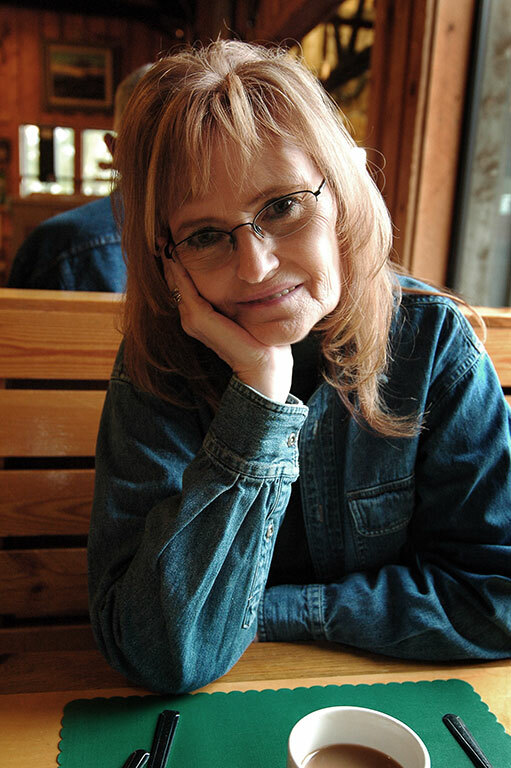 Abby gives me an adoring look at MD Ranch Cookhouse. 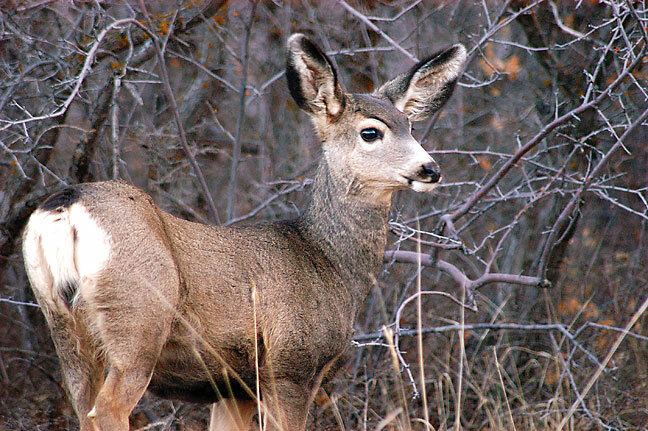 I spotted this mule deer on the Harts Draw Road near Monticello on my drive to Canyonlands. 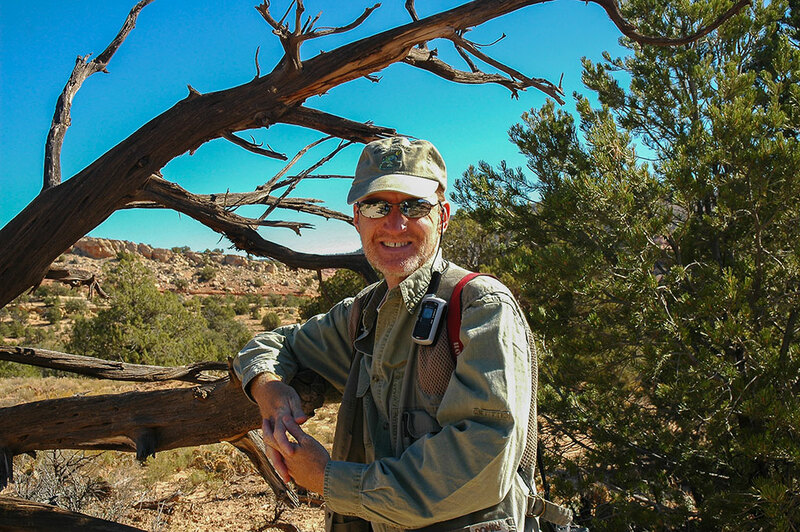 Abby took the day off to crochet and nap with the dogs, so I took the Hart’s Draw Road from Monticello to the Needles District of Canyonlands. I saw lots of deer, hunters, snow and Aspens. 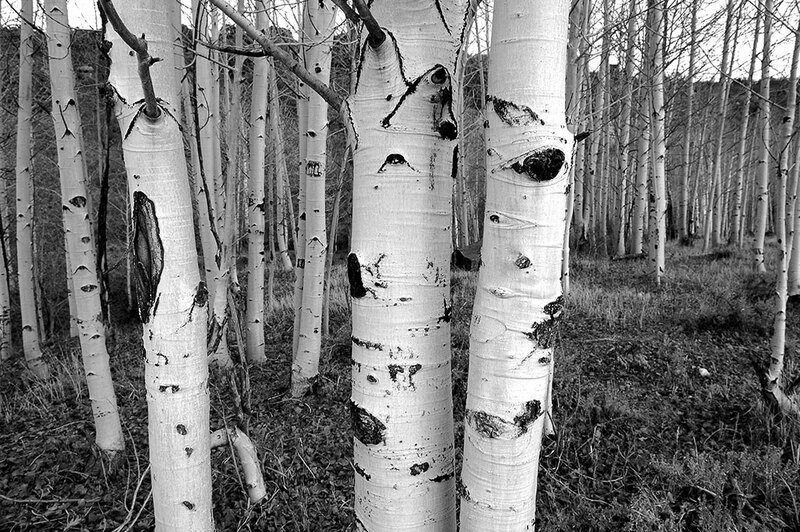 Aspens line the Hart’s Draw Road on the route from Monticello to Canyonlands. 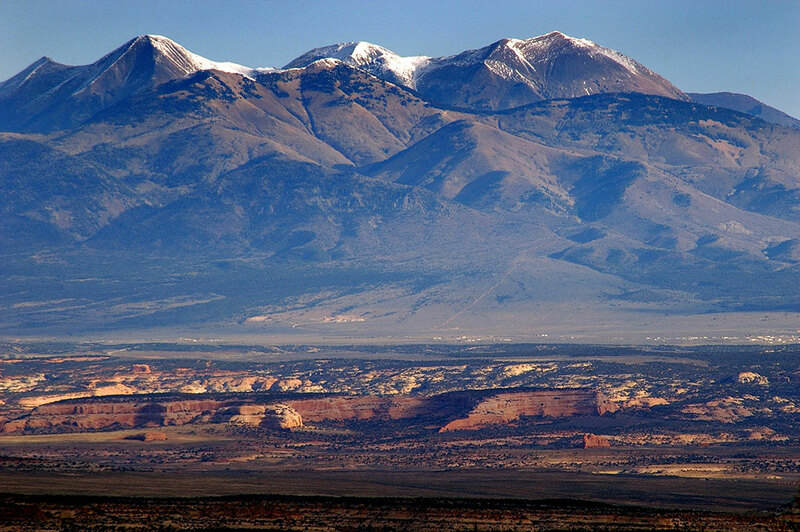 Also on the Hart’s Draw Road is this excellent, unobstructed view of the La Sal Mountains near Moab, Utah. 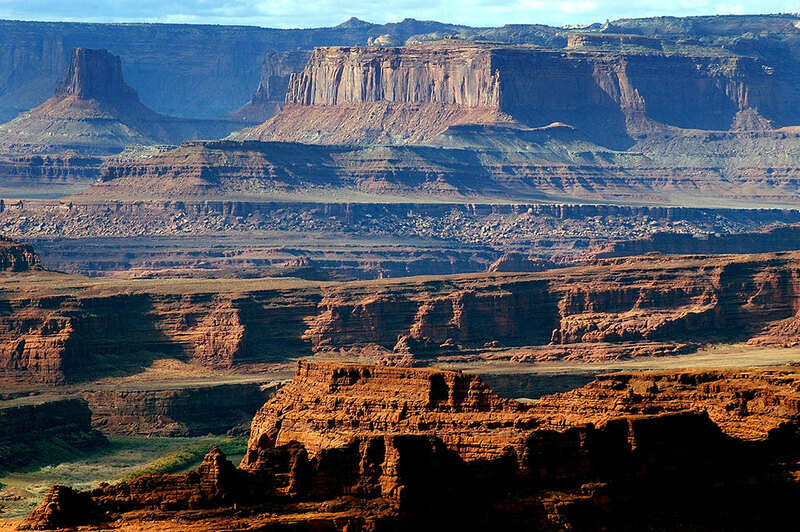 The Wingate sandstone cliffs of Canyon Rims line the Indian Creek road into Canyonlands. I hiked from the Squaw Flat trail head to Lost Canyon, then south until there were too many wet crossings, so I turned back. 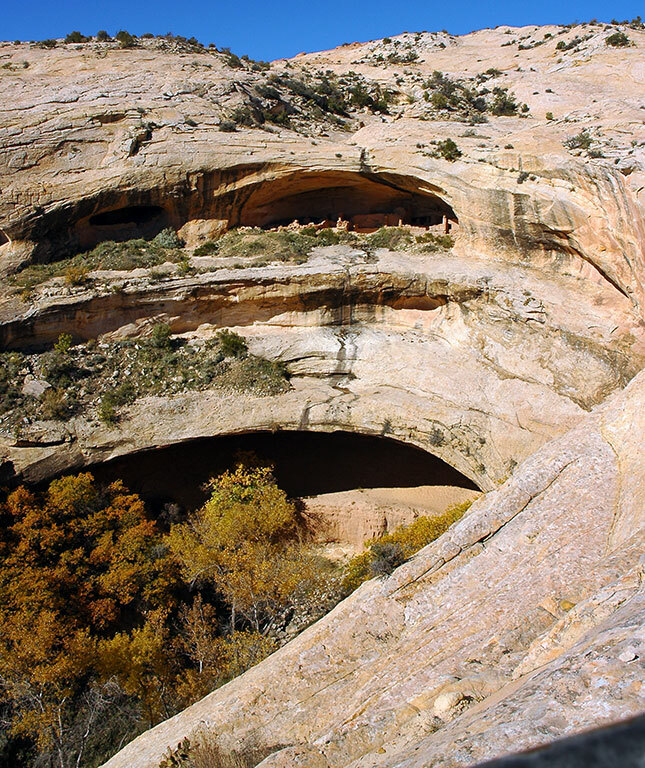 I made the Squaw Canyon/Big Spring Canyon loop, which connects at the southern end in a steep, spectacular bench and cliff complex that was some of the best hiking I’ve done in the park. This view looks at the same pothole as does the previous image, this time looking west. 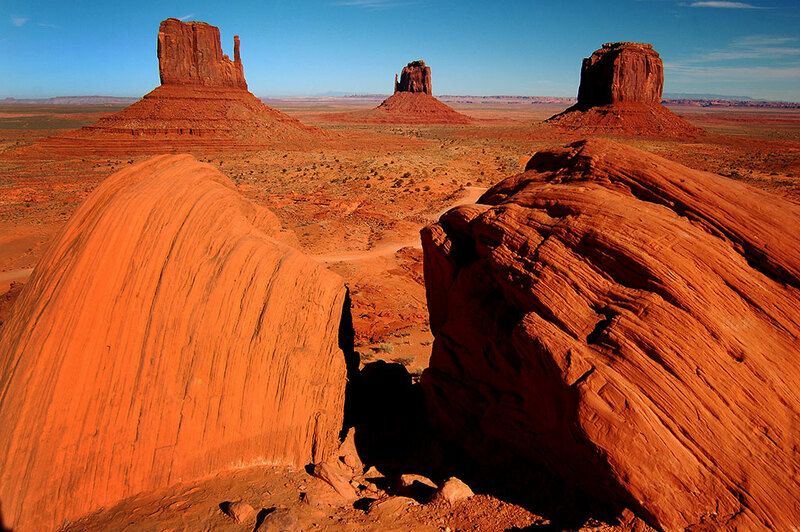 Images like this make the desert Southwest look like a playground to me. 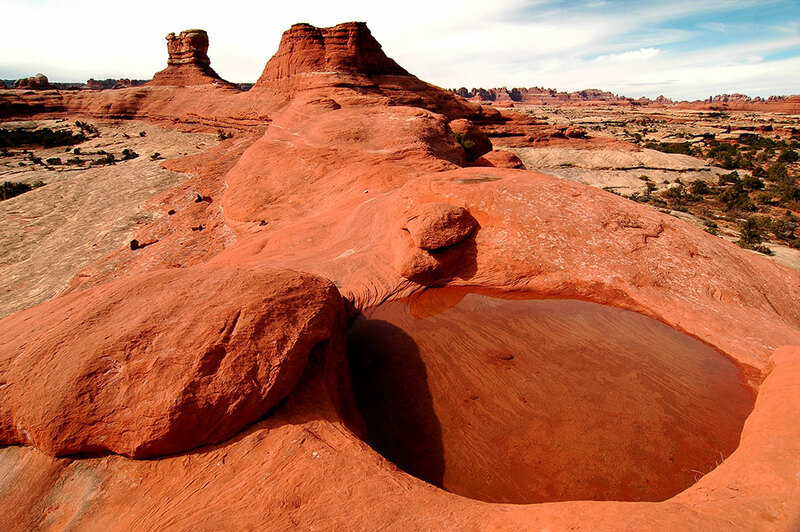 It’s always a pleasure to find water in the potholes at Canyonlands. It is a reminder of the life that flourishes there, and it adds another compositional element to my images. 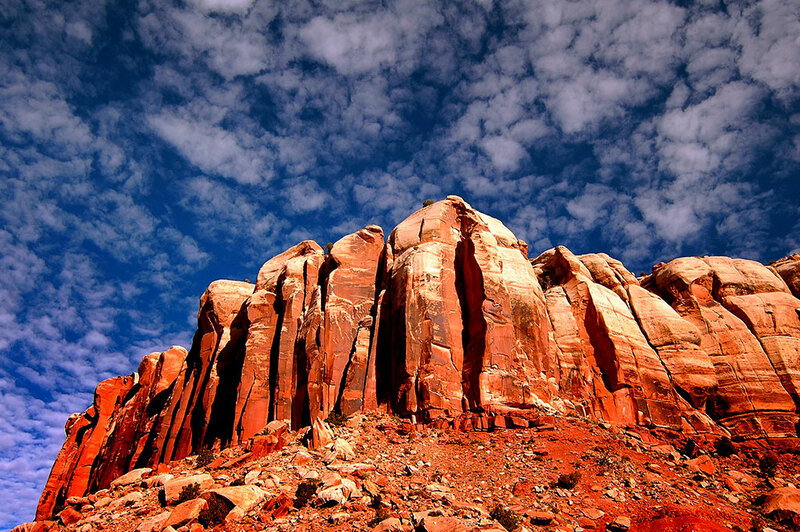 Early in my Canyonlands hike, the sky was a masterpiece of cirrus and blues. 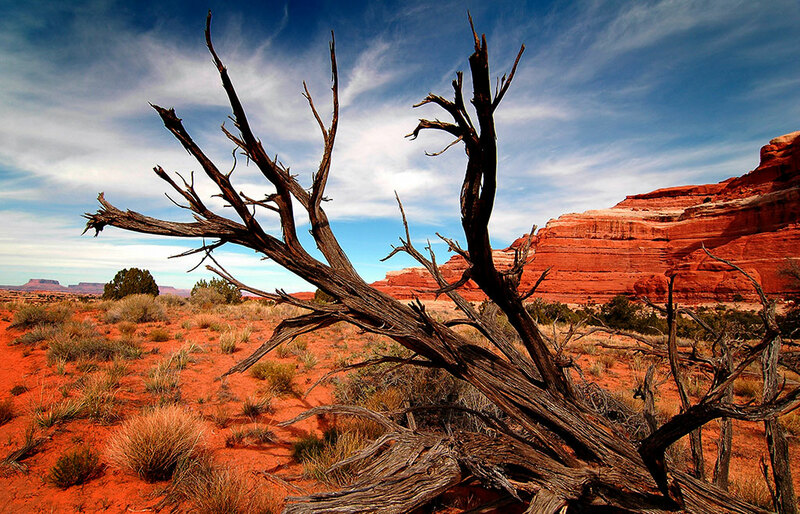 A dead tree is set against a pristine sky near Wooden Shoe Butte. 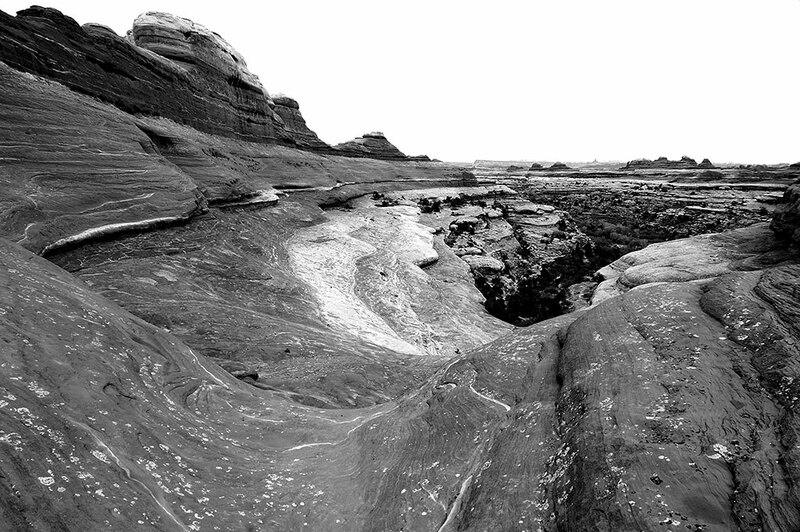 Striations are clearly visible in this creek bed at the intersections of two trails in the Needles District at Canyonlands. 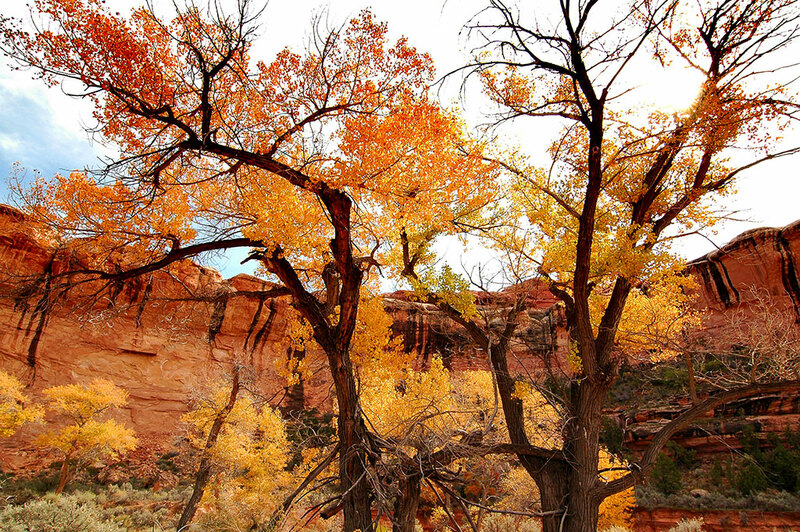 Cottonwood trees stand against a background of desert varnish on a cliff in Lost Canyon at Canyonlands National Park, Utah. 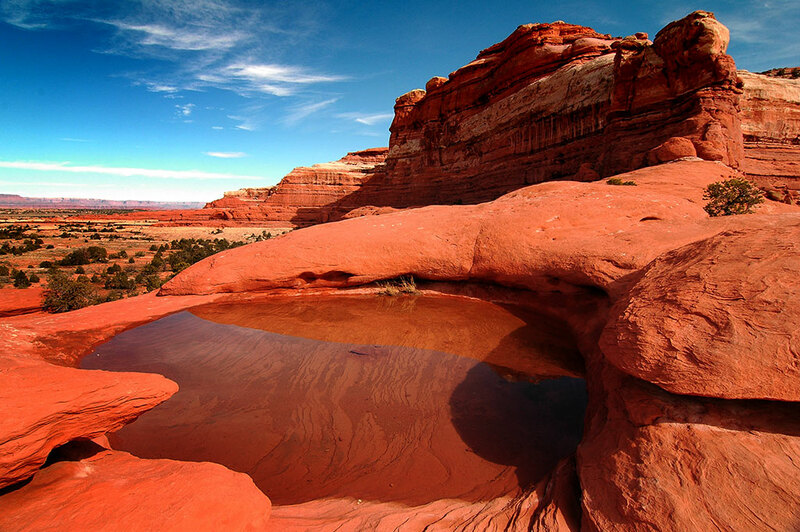 Lost Canyon, Canyonlands National Park. 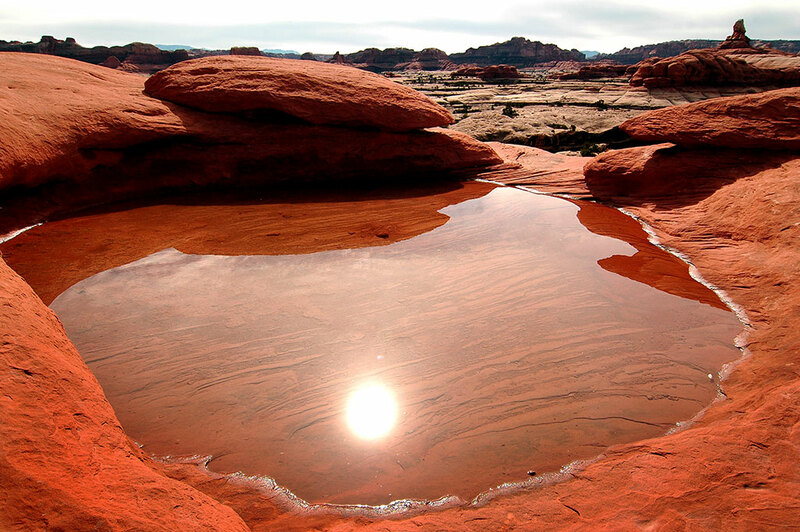 The sun played hide-and-seek on my Lost Canyon hike at Canyonlands. 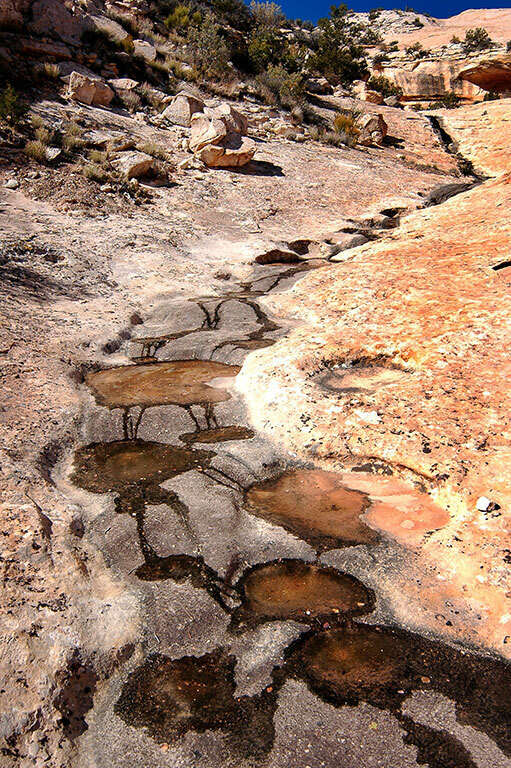 Potholes with water near Squaw Flat, Canyonlands National Park. This might be the smallest trail cairn I have ever seen. 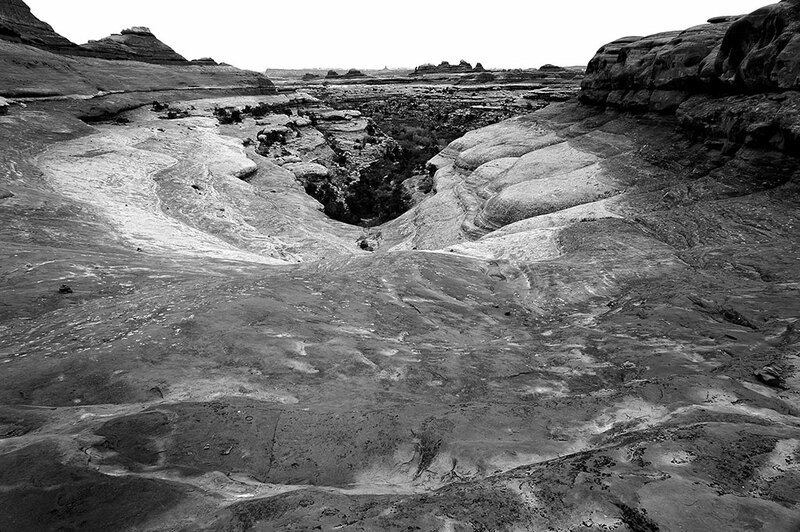 By the time I made the spectacular Squaw Canyon – Big Spring Canyon loop, the sky was cloudy, and I shot in black-and-white. 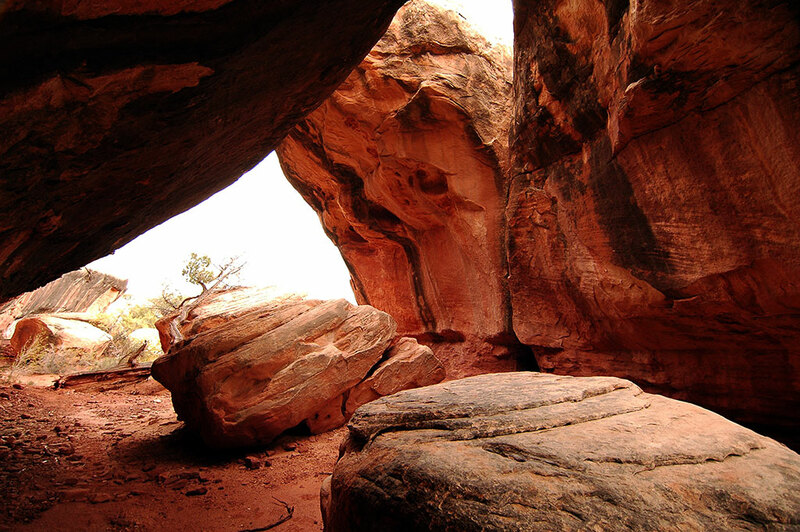 This image was made near the top of the Squaw Canyon – Big Spring Canyon bench. This view looks back in the direction from which I came. Climbing these benches was incredibly fun and beautiful. As I ascended these benches, I kept looking back and marveling at their intricacy. After topping the benches, I started by descent into Big Spring Canyon. 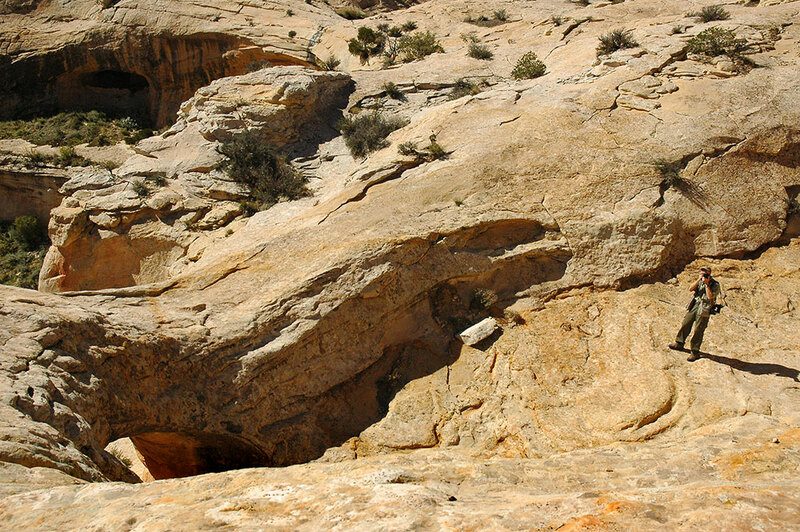 The return route on the Squaw Canyon/Big Spring Canyon loop (if hiked clockwise on the map) passes through this cluster of rockfall caves. 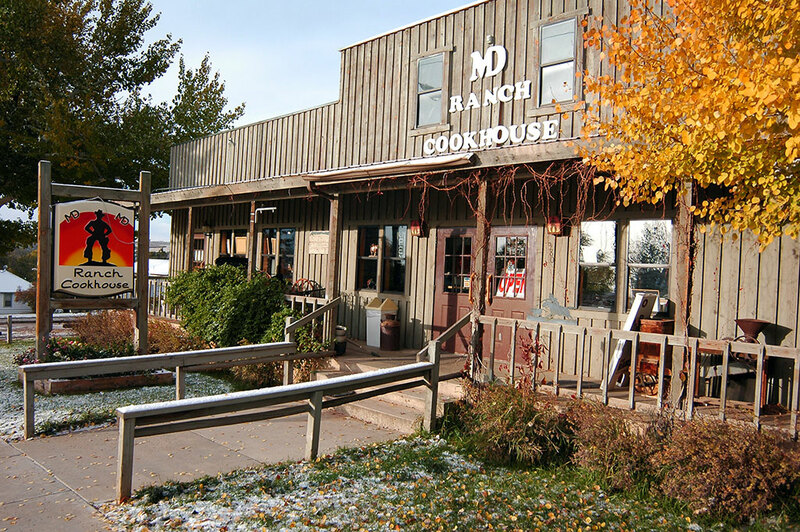 Abby and I loved the MD Ranch Cookhouse in Monticello, Utah. On two evenings of our trip, I brought their buffalo barley soup home for her. Abby was cold in the evening, so I got a cup of buffalo barley soup from MD Ranch Cookhouse and brought it to the room. She said it warmed her to the core. 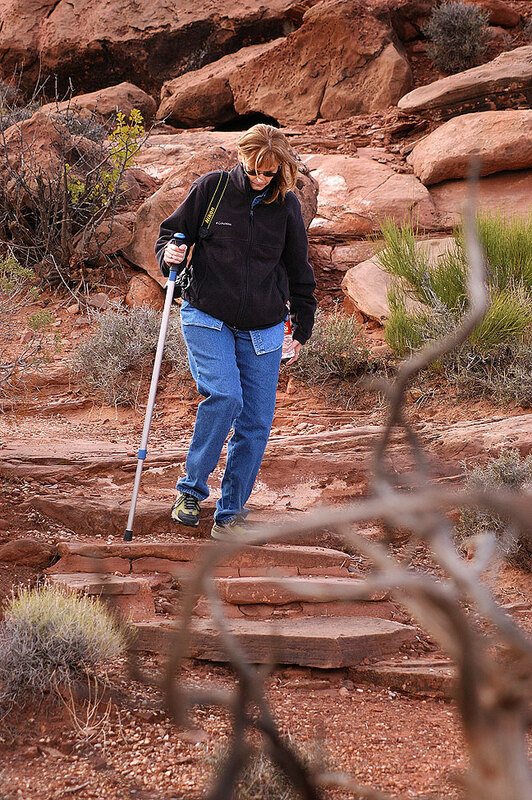 It was a very odd weather day, so after we heard a ranger on the scanner report hail at the Fiery Furnace trail head in Arches, we decided against hiking to Delicate Arch. Abby makes pictures at the Anticline Overlook. 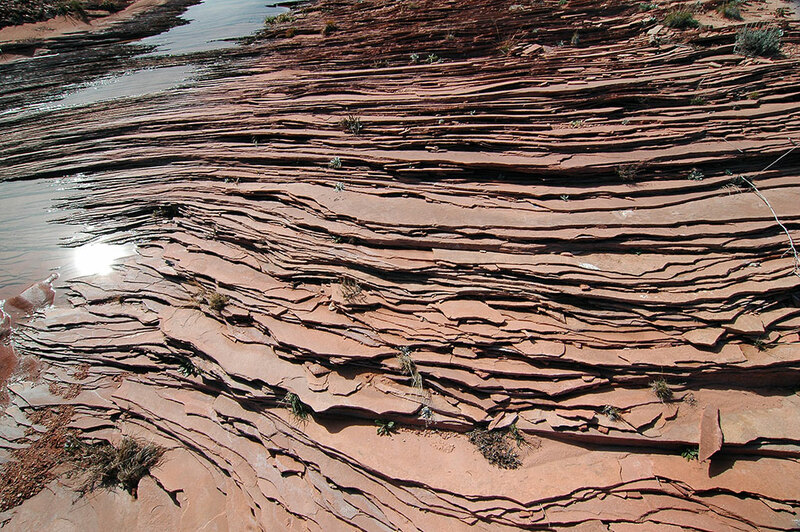 We drove out onto Hatch Point and had a look at the Anticline Overlook. We both had a great time shooting in some very complex light and a chilly breeze. Your host steps down a slope at the Anticline Overlook. 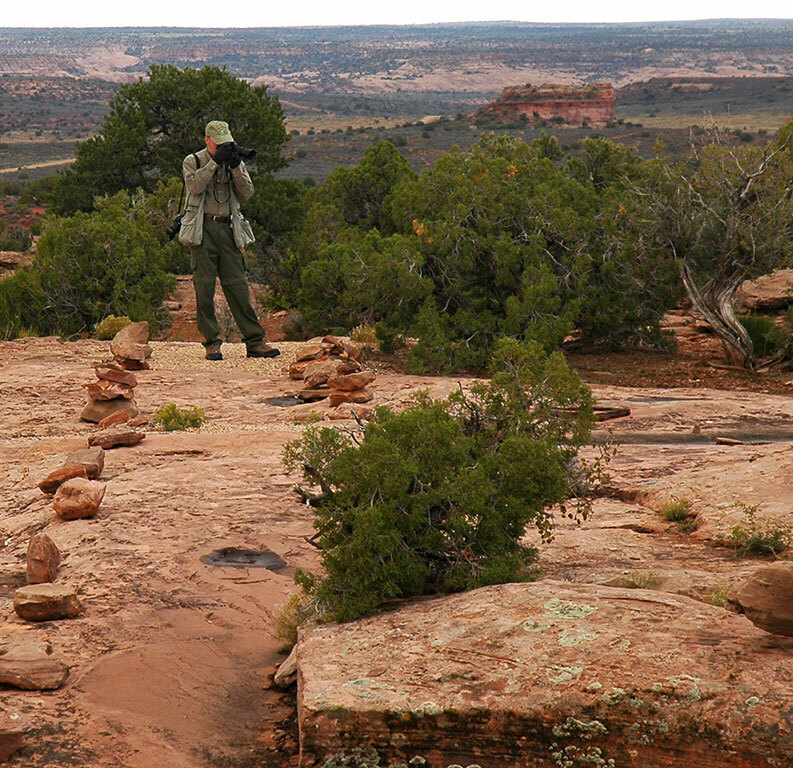 Abby is dwarfed by the scenery as she photographs the Anticline Overlook. Abby made this spectacular overview of the anticline, including the Colorado River and the potash mine. 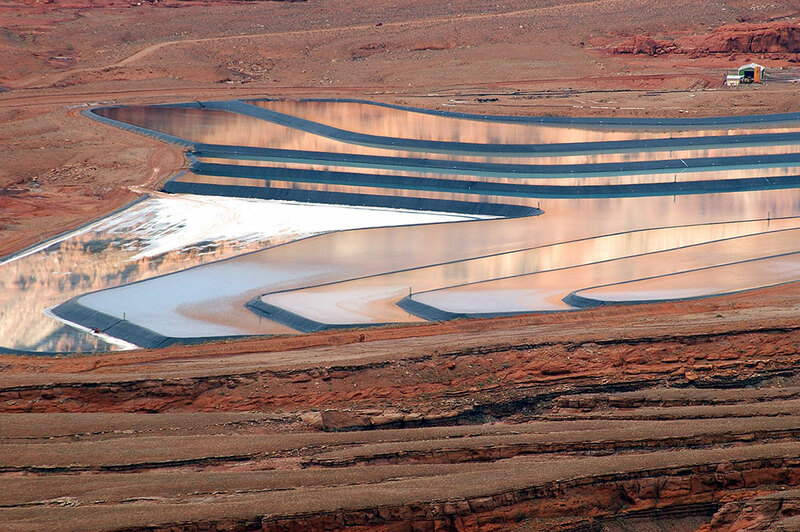 The potash mine near the Colorado River uses settling ponds. 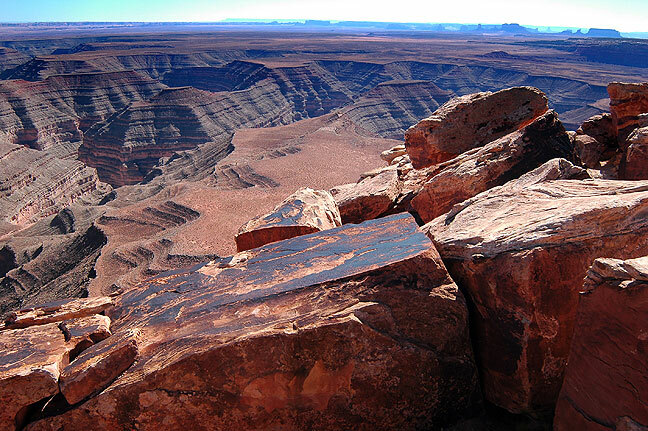 Not only are they visible from the Anticline Overlook, they are also visible from space. 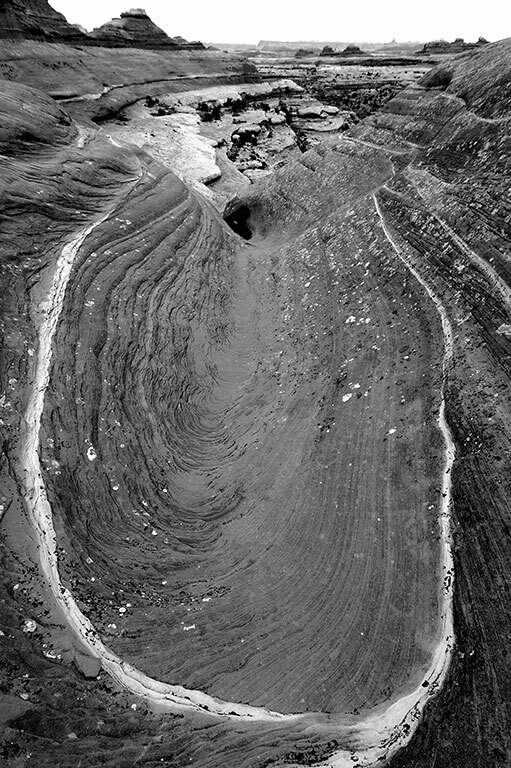 Taking just a few steps to the right partially hid the potash mine from view at the Anticline Overlook. 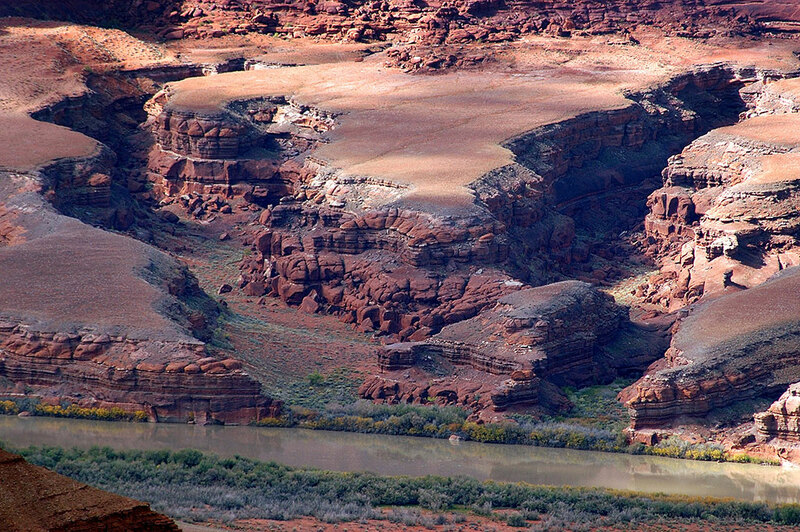 Tributary canyons of the Colorado are visible in this telephoto view from the Anticline Overlook. With swiftly-changing weather, this image was made just minutes later, also at the Anticline overlook. This view looks directly north from the Anticline Overlook. 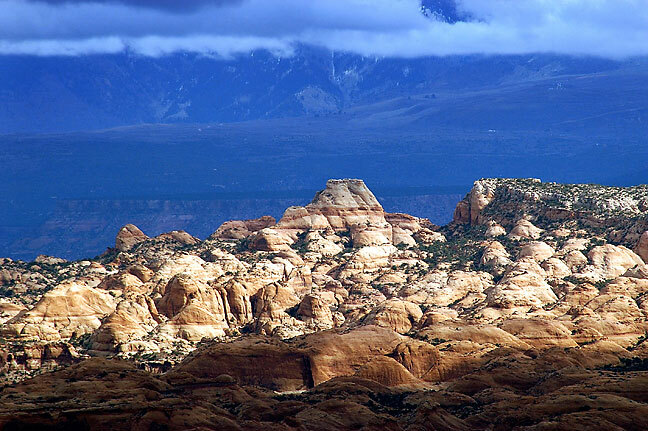 Though there is little hiking to ba had at the Anticline Overlook, image opportunities about, and it is only lightly visited, so we had it mostly to ourselves. We were amazed by how quickly the light changes on us at the Anticline Overlook. The right side of this wide shot from the Anticline Overlook shows the Hurrah Pass Road. 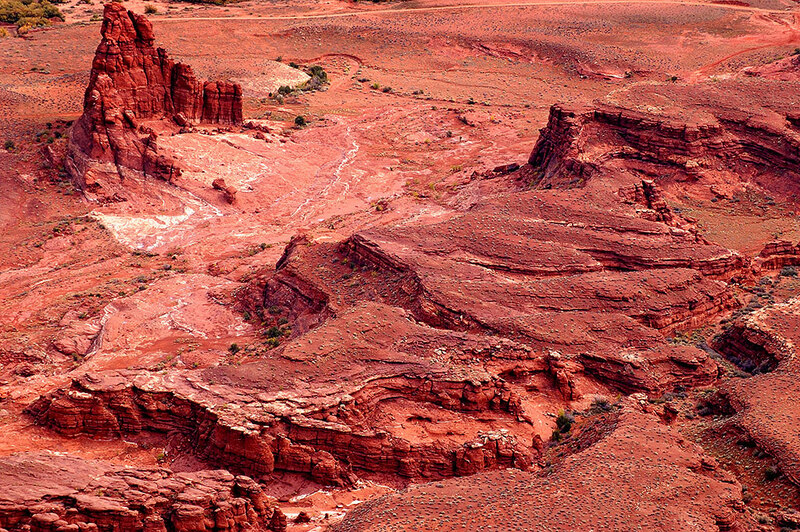 Another overview from the Anticline Overlook makes the Kane Creek area look like Mars. Your host smiles for Abby’s camera at the Anticline Overlook. 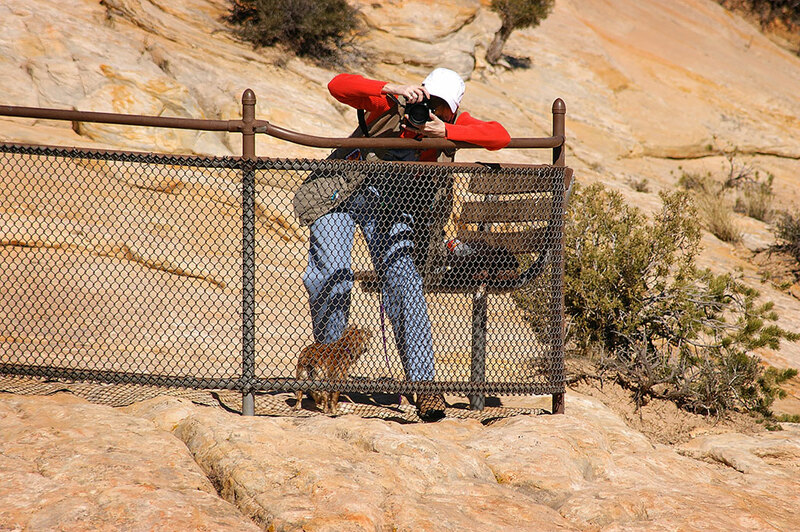 Abby makes pictures at the Dave Minor overlook on Hatch Point. 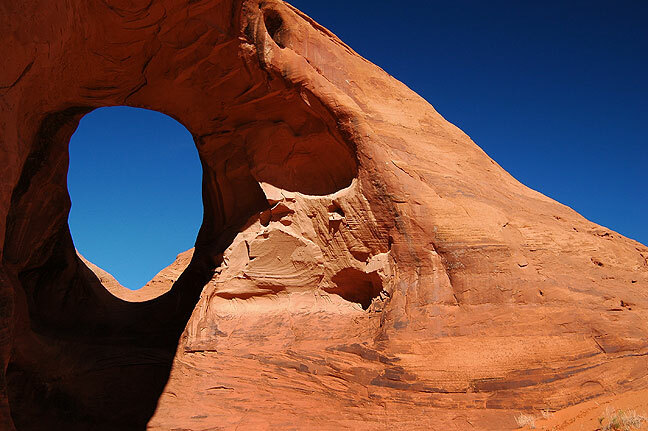 The Wineglass is an odd, isolated natural arch on Hatch Point. Abby spotted me walking back from photographing The Wine Glass. 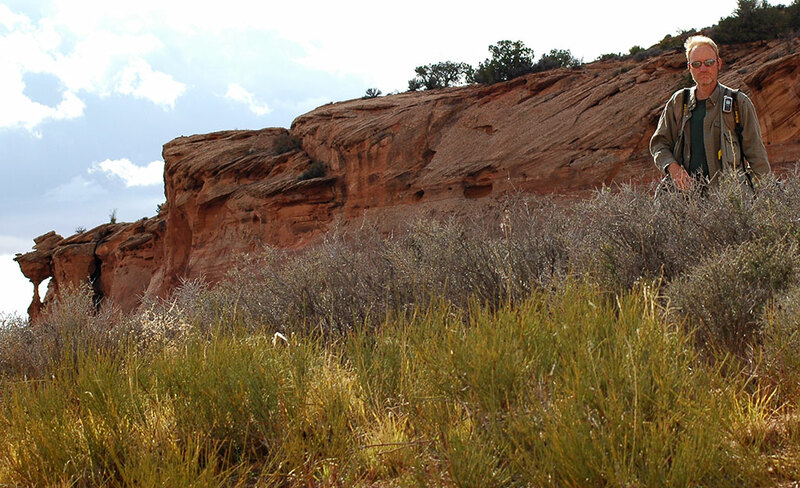 There is no trail, so one needs to be careful not to damage the vegetation or the soil, and to avoid rattlesnakes. On the way back to our motel, we ran into some very beautiful and surprising blowing snow in the Monticello area. It was simply a great time with my wife. Snow blows across the road north of Monticello, Utah. 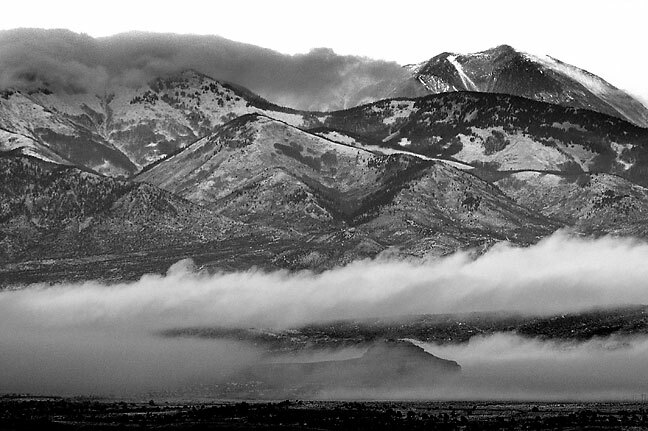 Clouds and blowing snow create this haunting view of the La Sal Mountains. 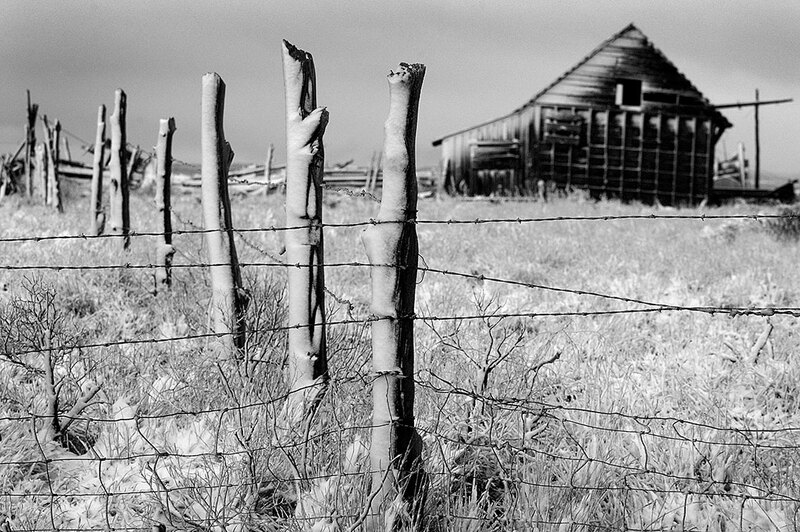 Snow clings to a fence and a house near Monticello, Utah. Max sits in my lap as we make our way home from our second anniversary adventure. It was a cold, snowy morning in Monticello, a perfect end for our second anniversary adventure. 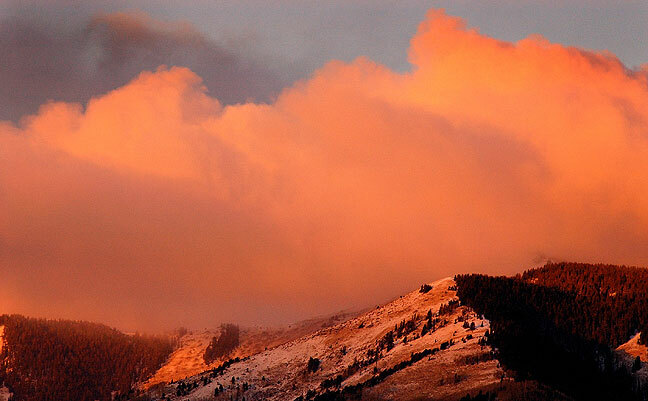 Light from sunrise casts a seep orange glow over the snow-capped Abajo Mountains in Monticello, Utah as we prepared for the long drive home to Oklahoma. Among the sights on the long road home was this lonely spot in far northeastern Arizona. Perhaps surprisingly, my favorite here is “Monticello snow”, which seems like it should be a still frame from a really cool independent movie. 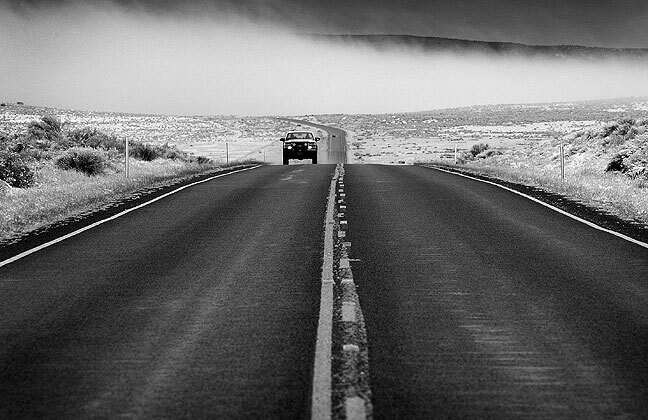 Not one about a road trip, but one about some crime or mystery in the desert. Just a setup shot to show where the protagonists had to go for the next scene. 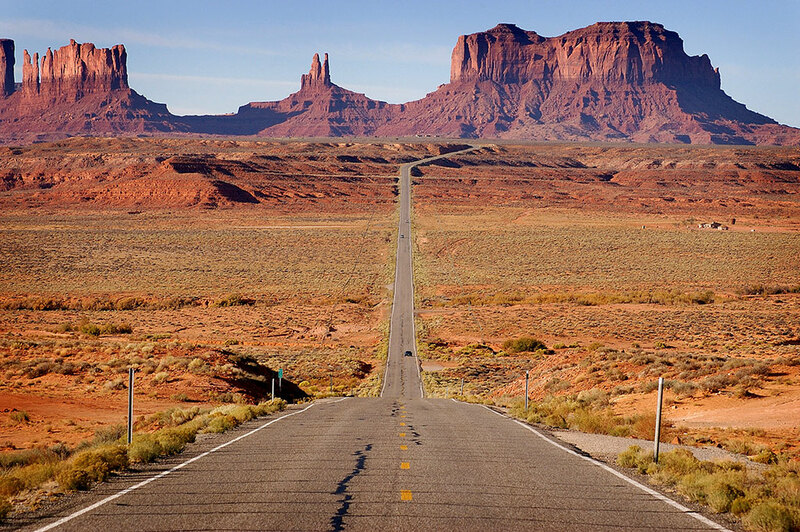 As for your “Monument Valley, Arizona, viewed from Utah on U.S. 163.” image, the one with the highway, your viewers already know it’s awesome. Perhaps they would be even more convinced when contrasting it with my own version.